This page is dedicated to my year abroad studying in Milan. I’ve been studying at Nuova Accademia di Belle Arti Milano (NABA) since October 2013, and on this page you can read about my whirlwind adventure, and also take a peek at the work I’ve done since I’ve attended the institution. I’m so lucky to be studying at such an amazing school, but it didn’t happen without a lot of hard work. I started my journey when I was in my 1st year of Uni. I remember having a presentation on the Erasmus scheme and all of the amazing things you can get out of the experience. I remember them telling us that there are only a very limited amount of people who can get this opportunity, and those people had to work really hard and prove that it was the right thing for them. At that moment I didn’t really think I would ever be in with the chance, because I was by no means the best in my class. I had a few days thinking about it and I remember speaking with my Mum on the phone about the idea and the fact that it was something I think I might like to do. When it got round to second year I started thinking about it again, and then we had another presentation on the scheme. This was when I knew it was something I really wanted. I remember them telling us you can go anywhere in the world as long as you work hard to set up the connection with the university it should be possible! 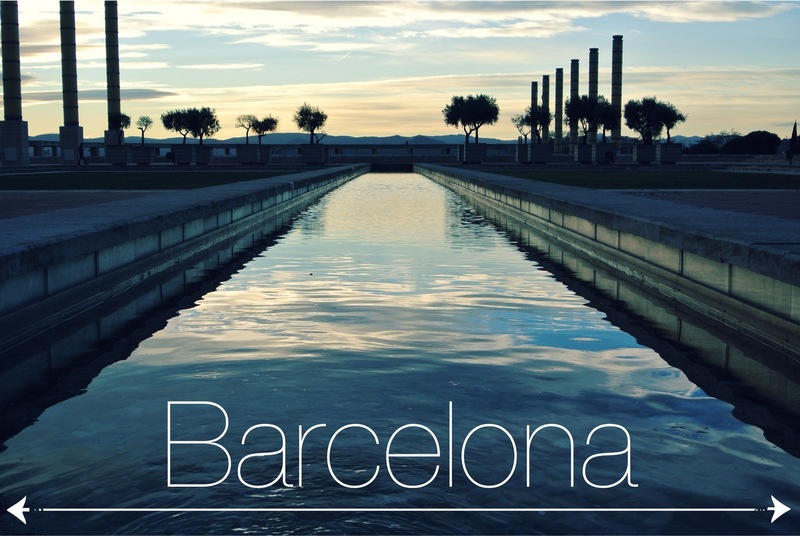 At first I had my heart set on Barcelona. I’ve no idea why just the fact that the place really appealed to me. I spoke to a few people at Coventry University about it, and sent a lot of emails back and forth for quite a number of weeks. I set up a meeting with Stefan Musiol to discuss the idea of going to Barcelona. I spent a long time researching into the different universities that take part in the Erasmus scheme. In the meeting Stefan told me he didn’t really think that Barcelona was the best option as although the University there was good, it wasn’t great, and the best option available to me was NABA in Milan. He gave me an application form and asked me to fill it out there and then and said that if I pick NABA he will guarantee me a place. In that respect it really paid off for me to show how enthusiastic I was about taking part in the Erasmus scheme as it got me a place in a really highly regarded university. This wasn’t the end of the application process. 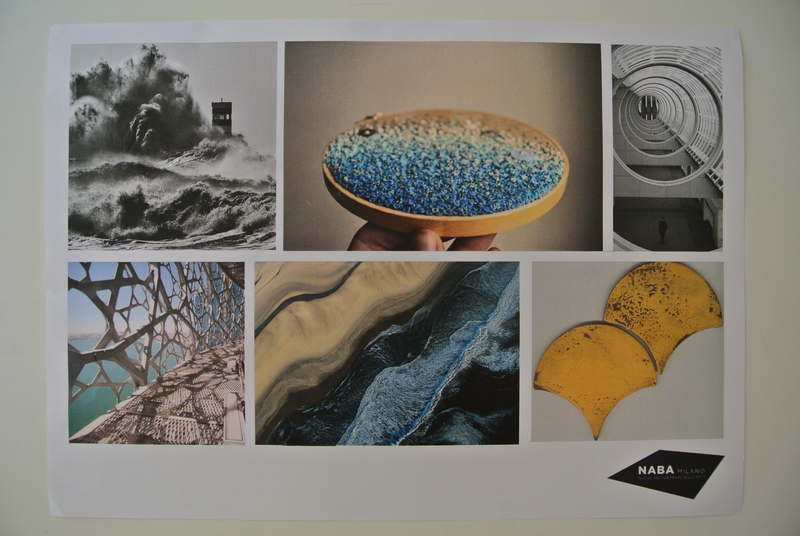 Before I could go I still had to send off my portfolio for a review and also a second application form to NABA. It took a while for them to confirm my place, and at one point I was really beginning to doubt the fact that it was happening. It wasn’t until the middle of the summer holidays in 2013 that my place was finally confirmed and it was 100% official that I was actually going and the dates that I’d be starting! I’m really grateful for the experience I’ve had at NABA, I’ve learnt 100x more than I ever expected, and although it’s been really hard at times and I’ve had some ups and downs I’d recommend it to anyone who wants to put the time and effort in because the rewards are amazing. There are so many things I can take back to Coventry with me and I feel so much more experienced, especially in Pattern Cutting. Aside that, the memories I’ve made by meeting new people and going to new places make it 100% worthwhile. This page is set out month by month starting with October in the form of a log which outlines what I managed to get up to at that time, how I was feeling, and what I was learning. I’ve kept a personal diary throughout my entire time here in Milan, but thought it’d be easier to type the main bits up so I can add the relevant images in the relevant places! If you’ve already read my blog post from October you’ll know how stressful this month had been! The adventure to Milan began on the 5th October 2013 when I set off on a gloomy morning from Gatwick Airport. Before I went everyone was asking me about how excited I was, but in reality I really wasn’t excited at all. The furthest I’ve been from home on my own is Coventry – which admittedly is a 3 and a half hour drive, but still not quite as far as Italy. An entire separate country, where they speak a different language, have a different currency, eat different things, do different things. Everything was set out to be very ‘different’. Sitting on the plane I tried to think of anything else than the thought of my dad and sister who came with me leaving me two days later, but it couldn’t quite escape my mind. I’ve always been a homesick person, and I’ve always known that, so moving abroad was a very big thing for me, the longest I’d ever really been away from home was about 3 weeks, and even then I knew I could speak to anyone at anytime because they’re only ever at the other end of the phone. The first thing I wanted to do once I got to Milan was sort myself out with an Italian phone contract so that I could have access to the internet on the go and let my friends and rest of my family know I had arrived. It was quite ridiculous how adamant and focused I was at getting my phone set up. I found myself going from phone shop to phone shop looking for the best deal and not caring about anything else. It was only when I saw my Dad and sister no longer by my side that I actually looked up and saw them looking at the Duomo. I’m still not entirely sure how I managed to miss such a huge monumental building. My dad and sister leaving me on the Sunday was hard as it really sunk in then that this was really happening, and this was my new home. For the first week I was staying in a hostel. I’d never stayed in a hostel before and didn’t really know what to expect. I was worried about the security of my belongings, especially as I quite literally had my entire life in a suitcase. I wasn’t expecting to be in uni for the first week, the main plan was getting an apartment sorted, but it turns out that we were in uni, and it would be everyday. The first week at uni was basically a big introduction to the course, and what the year would entail. It was about getting the right forms signed to finalize the exchange. Sorting an apartment was the most stressful thing I’ve ever done. In my October blog post I referred to it as the ‘biggest challenge so far’ but to this date it still has been the most stressful part of my journey. Communicating with estate agents and landlords was really hard because neither of us would speak the same language. We finally found an apartment on about the 8th October, and by the 10th we’d signed the contract and moved in. Living in Milan is not cheap. The rent is expensive, the deposit was expensive, and the estate agents fees were expensive too, all of these things added to the stress of finding a place to live – because we weren’t really sure if that was good value, standard, or if we were paying too much. We had a weekend to settle in to the apartment, and literally had to buy everything again. My room was really empty when I moved in, and really didn’t feel like home for a while. On the first day we got there, we took a trip to Ikea to get bedding, towels, and kitchen essentials. Once I’d unpacked it started feeling a little bit more homely, and since then I’ve added so much to my room I’m worried about how I’m going to get it all back to England! On Monday the 14th I started an intensive project at NABA to create a collection of t-shirts. This project was only 2 weeks long and had a lot of work to it! 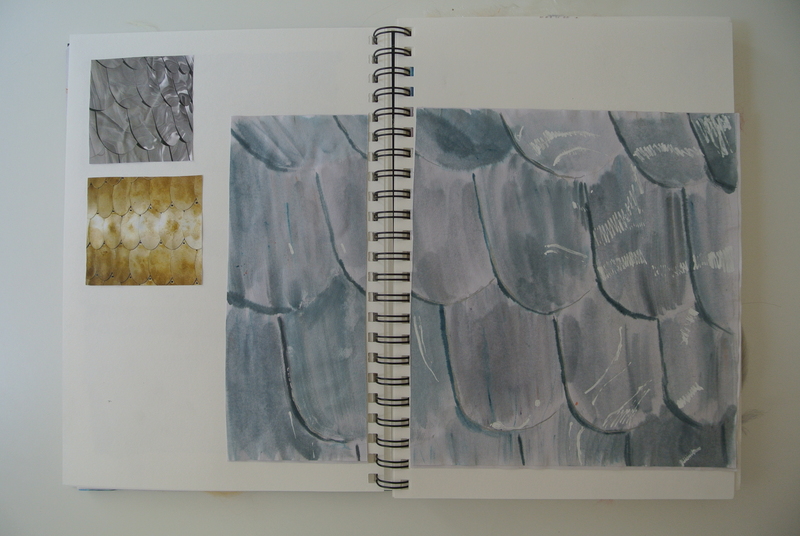 We had to create a sketch book and do all the research you’d expect for a full module at Coventry University (CU). I had no idea how I’d actually manage to complete it, but I did! I wasn’t sure which route to take my t-shirts down. 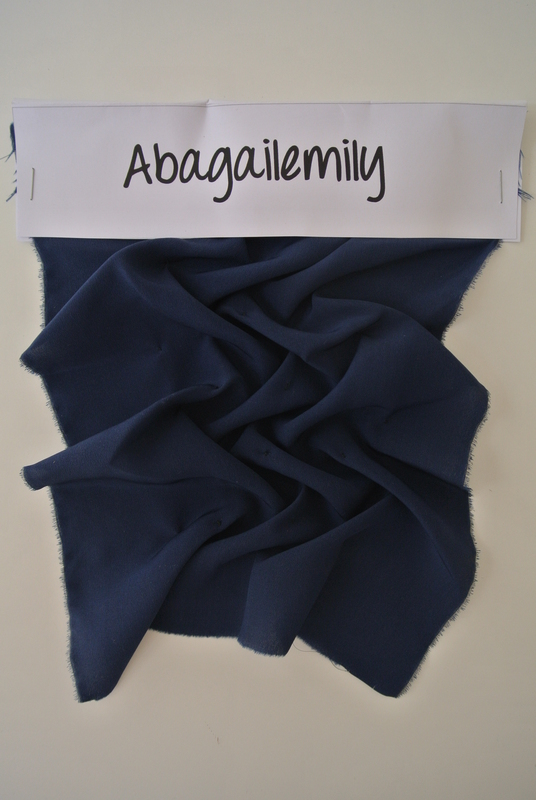 I wanted to continue with my last project at CU under my brand ‘abagailemily’ but other than that didn’t really have a clue. If I was to keep it to my branding, it would have to be fun and girly, and so that’s what I researched for. 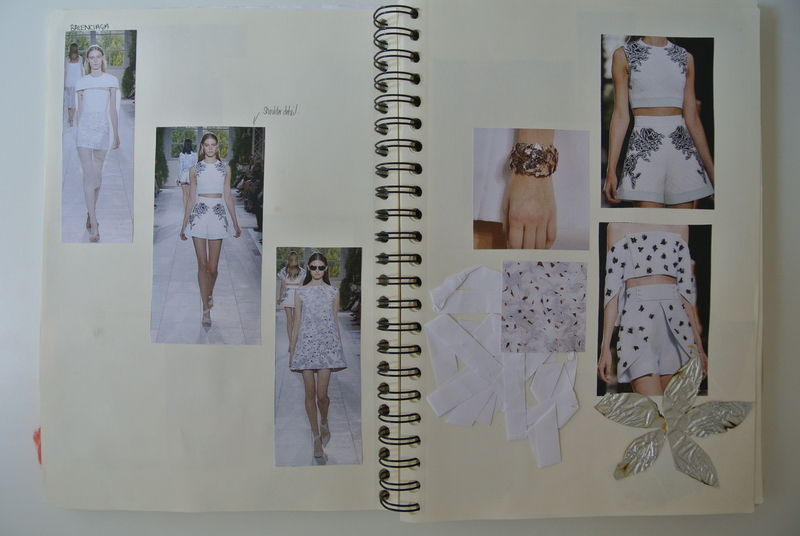 I had a look at the S/S14 catwalk collections to get a little bit of a feel of what was up and coming and really liked the idea of using florals. I wanted to make it a little bit more 3D so embellishing my own flowers, instead of using a print. 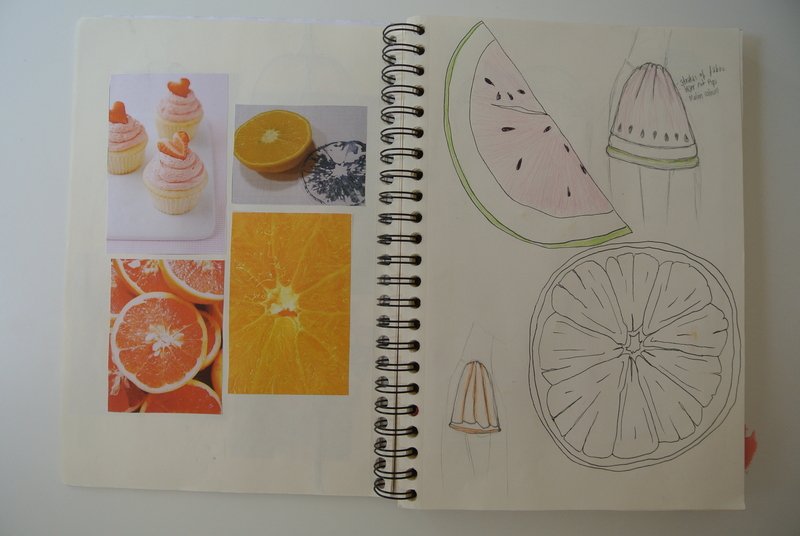 From the idea of florals, I also started thinking about fruits. Once I’d done a couple of designs I really started to get into it and was really liking my ideas. 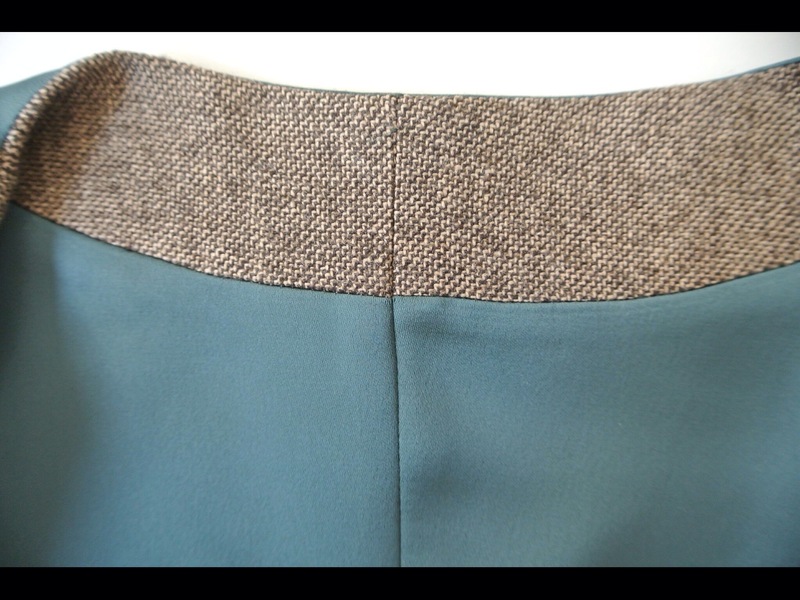 As this project was only 2 weeks long we were allowed to alter ready made garments to fit them to our own designs. I bought two t-shirts from H&M and set to work on them. We had to design a collection of 6 t-shirts, but only had to make 2. 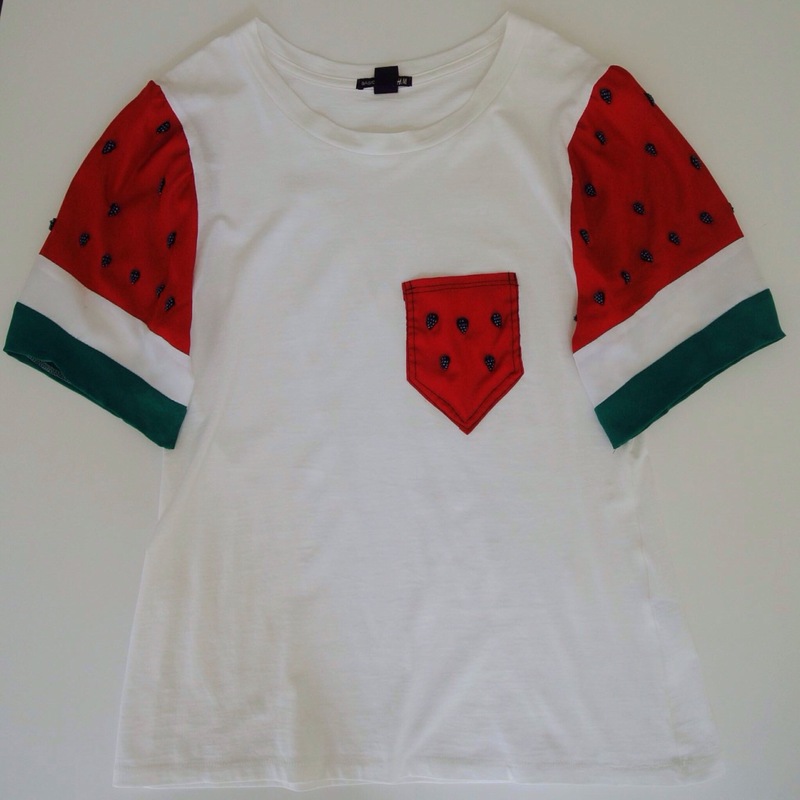 My designs featured the fruits watermelon, orange, and kiwi. I was thinking of fruits that had good segments and that looked interesting when they were sliced in half. Initially I was thinking of doing a children’s wear collection, as my tutors at CU thought it’d be something I could excel at. My children’s wear designs had the same theme of fruit and flowers, although, they’d all have faces! As it was something I’d never done before, I thought it would be best to stick to something I know, as we didn’t have much time to play with! I’m pretty happy with the way this project turned out. I got a lot of work done in a short period of time, which really proves that if you knuckle down and focus you can get anything possible done! My garments weren’t made to the best standard, which is something I really want to improve on and if I get the time I do still plan on re-creating them! It really helped that I already had some experience in t-shirts as one of my projects in 2nd year at CU meant I had to do a few. The deadline for the project was the 24th October, and we got feedback straight away. The tutor of the project, Manzi, agreed with me in saying that my garments quality wasn’t the best, but he liked that I used my initiative to create something fun and not quite what you’d expect. 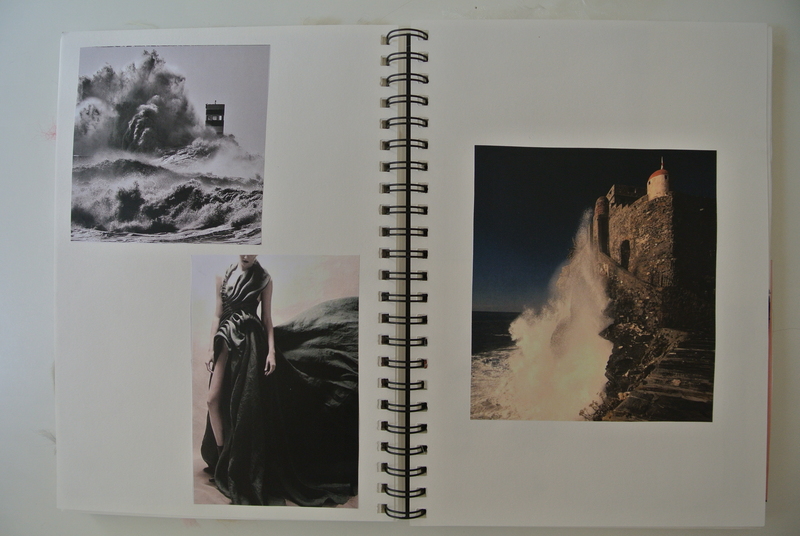 He said that he liked my sketchbook work and that I used it in a 3D way apposed to just drawing. That day I had my first visitor in Milan, my boyfriend Joe. It was really nice to have someone to visit and have a little bit of time to just relax and explore the city. We spent the Friday exploring Milan, and went to the top of the Duomo which was really exciting, and something I’d recommend to anyone visiting Milan. You get the best views of the city! I’d not spent much time actually looking around Milan until then, and it wasn’t until that moment that I found out the tallest building in Italy was in my city! The next day we went to Monza, it was one of those moments where we just turned up at the train station and said ‘lets go somewhere’ so booked the first (reasonably priced) train out of Milan, which just so happened to be going there. Monza was beautiful, it was quite quiet but the weather was really nice that day so we just wandered around and had a little look in all of the different shops. That evening our train arrived at a different station, and we weren’t too sure where we were to walked outside and to our surprise had the massive Uni Credit tower right beneath our feet. The area surrounding the tower was really pretty. As we went at nighttime it was lit up, and had little fountains around it. There was also a free exhibition to show the construction of the tower. It turns out that the tower is actually in Pta. Garabaldi, one stop before the usual train station, Milano Centrale. Monday morning came back around and I headed back to NABA to start the official course. It wasn’t until we actually got there that we realised that we didn’t have any lessons on Mondays! So instead I spent my day doing research in the computer suite as the internet in my apartment still hadn’t been set up! 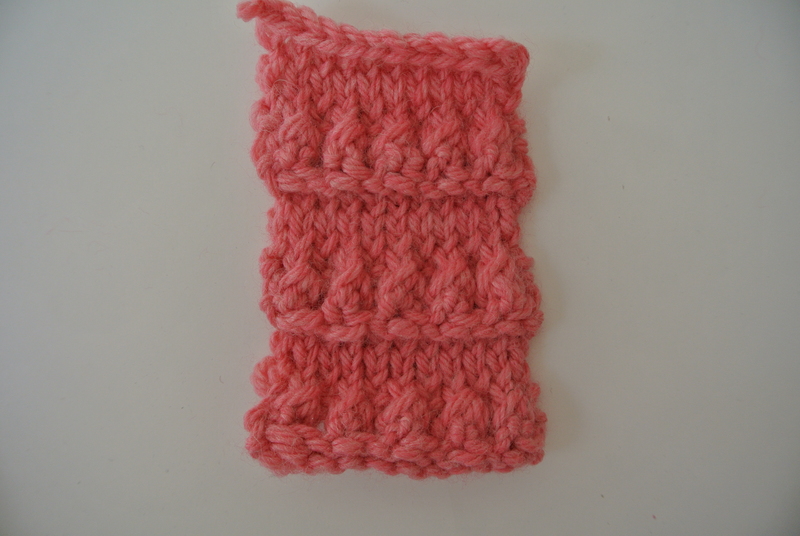 The classes actually started on Tuesday 29th, which kicked off with a knitting class. Knitting is something I’ve never ever done! And not something I’d ever really thought of doing. It was in the first class that I realised how unorganised the Italians are. We were supposed to receive an email telling us all of the equipment we’d need for the classes, so first of all we had to go and buy everything! The first class of knitting was really hard. I really didn’t understand it and I was hopeless! I spent that entire evening trying to get my head around it! On Tuesday after knitting, we had marketing. Our tutor, Damon was really cool. The first class was really just about getting our heads around what the course was really about, and Damon introduced himself and said a little bit about how he got to where he is today. Wednesday was our first Fashion Design class with Helen Field. We spent the first lesson having ‘Art lessons’ having to draw a self portrait (which I hope no one will ever see!) also a fashion illustration and then a portrait of the person sat opposite us. It suddenly dawned on me how awful I was at drawing when put on the spot! That had to be one of the things I needed to improve during my year away. In the time that we weren’t drawing, Helen spent the lesson picking fun at us, calling us ‘hopeless’ for being from CU. So that was the beginning of my journey to prove Helen wrong!! Thursday was our Pattern Cutting class. For this one we did actually get the memo of what we needed to bring. For the first week this class was my definite favourite. We started off having to create a Men’s waistcoat. The class wasn’t delayed and we got straight in to it. It definitely seemed to fly by but I got so much work done for the 4 hours that I was there. That night was Halloween, and was my first night out in Milan. It wasn’t quite like going out in England but I had so much fun, and made lots of new friends! That night marked the last day of the first month in Milan, and I could never have imagined I’d be enjoying it quite as much as I did, and also how quickly it would go by! November started off with a super long 4 day weekend. Friday the 1st was an Italian bank holiday, so provided time to recover from the night out before. I spent the rest of the weekend wandering Milan, and exploring the center. At this point we (still) didn’t have internet in the apartment. I took my laptop up to the Duomo to sit outside and use the free wifi hotspot to do research for the project Helen had set us. I must have looked so ridiculous. 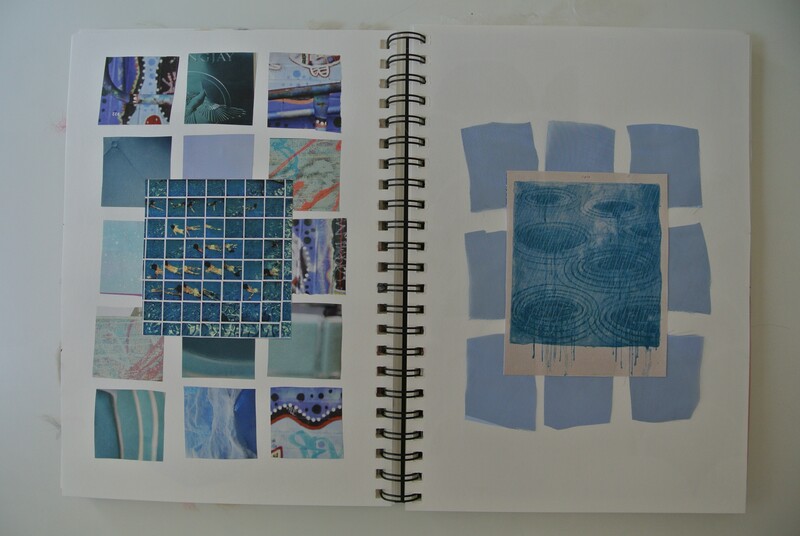 Helen had set us the work of collecting 12 images to stimulate a collection. There had to be one for the direction, two for fabric, two for colour, two for borders, two for details, two for volume, and one for location. All of these images would inspire our collections, but couldn’t be fashion related. I decided I wanted my collection to be inspired by the shipwreck collection of artworks by William Turner, so my images were all to do with the sea and shipwrecks. For Helen, we also had to research 5 designers that inspire us. This week was a little easier, as I knew what to expect from the classes. 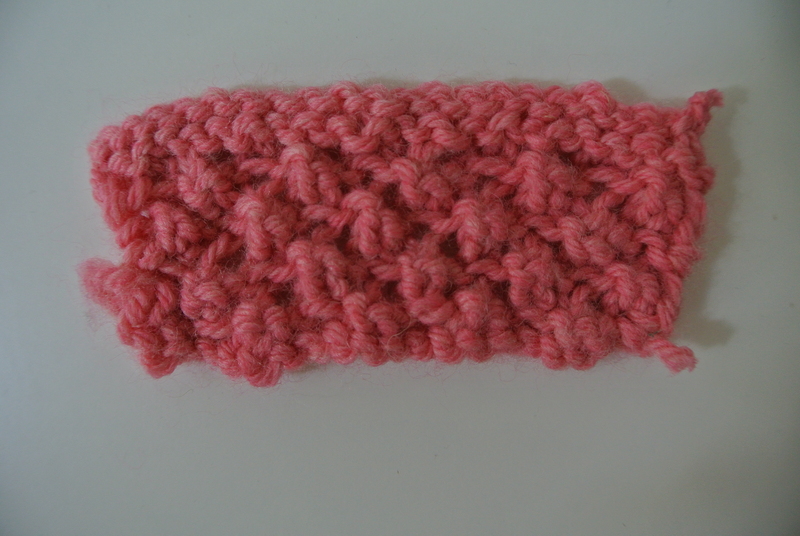 The knitting got a little bit easier, but as soon as I thought I’d got it, I was introduced to a new stitch. 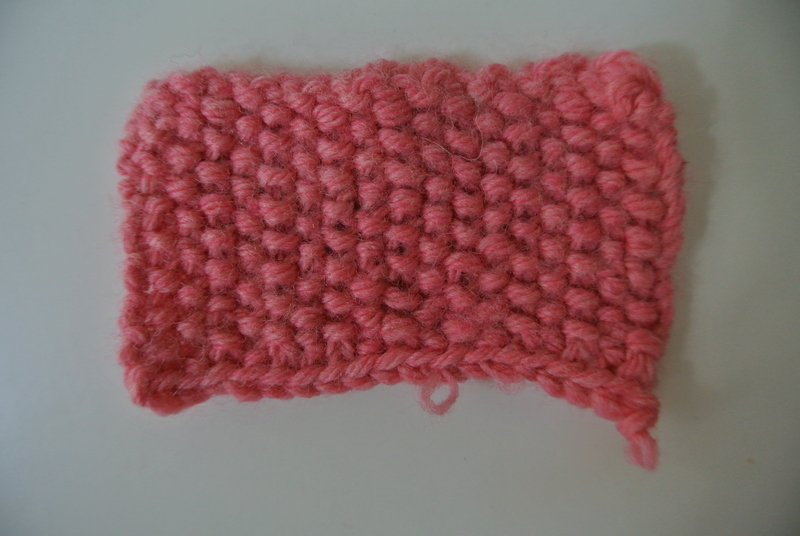 The one I started on was ‘knit stitch’ and found that difficult, then on Tuesday 5th Nov we had to start to learn the Purl stitch. Friday was my most exciting day of this week. We started the Textiles course, where our tutor Angharad was going to teach us all about the different dying and fabric manipulation techniques. The first lesson was pretty fun, I got to learn how to smock! I’d seen it before a few places but never known how do it. I was really enjoying the fact that all of my classes were very hands on, and involved. It was also really nice to be doing lots of different things at the same time, as it made the week go really quickly. More importantly than textiles, on Friday 8th November my Mum and Sister came to visit me. They arrived on a really wet and rainy day which wasn’t the best introduction to Milan, but the weather cheered up and it ended up being a really really nice weekend. We spent our time wandering Milan, and discovering new places. By this point I knew my way around Milan a little bit more, so could almost be a bit of a tour guide. One thing I’d really wanted to do for a while was go out for aperitivo. We did it in the first week of being in Milan and there’s nothing like it in England! Aperitivo is basically where you buy a cocktail and then you get a buffet of food for free! I told my mum and sister about it, and they both agreed it’d be a nice thing to do, so we had a wander down the canal that evening to find somewhere that would do it. To my surprise, pretty much all of the bars had a huge buffet of food in their windows! The prices ranged from about 5 Euros to 15 Euros, so we settled for one in the middle. We ended up at a bar called Ginger and had the best cocktail I’ve ever tasted. The food in Ginger is pretty much all Vegan (although they do have some meat in certain dishes). I’m not vegan, or vegetarian for that matter, but the food was so amazing, and makes me think it’d be pretty easy to become a vegan/vegetarian if I was visiting Ginger everyday. Ginger is still my favourite bar to visit in Milan, I must have been there over 25 times now! We spent our Saturday seeing the sights of Milan. I took them both up to the top of the Duomo after having such a good experience with it before. This time the weather was a lot clearer so you could even see the mountains in the background, it was absolutely amazing. We also visited the Castello for the first time, which is about a 10 minute walk away from the Duomo. We walked through the grounds and stumbled across a really huge park which had a little lake in the middle with bridges to get over. There was also the Arch of Peace at the other end! Which I didn’t even know was there! It was so nice to just walk around and find new things that Milan has to offer. The one thing that became apparent that I didn’t know a lot about was places to eat in Milan. One lunchtime my Mum asked where was best to go for a cup of coffee and a light bite. This was something I really didn’t know the answer to! I hadn’t been out for lunch since I’d been there, as I was at Uni every day I’d take my own lunch with me, and make a sandwich to eat there. It was quite stressful feeling the pressure to find somewhere that wouldn’t be too busy, or too expensive, as I really didn’t have a clue about what was on offer. We ended up at a small pizzeria just off of a side street in the main center. We then discovered the ‘Cover charge’. Most Italian restaurants put a cover or service charge on to your bill. Its a compulsory fee that’s usually between 1.50 euros and 3 euros each. We discovered that you even pay the cover charge if you simply sit at the table with someone who is eating, but you don’t! It was really nice to have a couple more visitors to see me, and also have a chance to explore the city a little bit more. It was sad to say goodbye again, but I quickly got back into the swing of the work I had to do. On Wednesday 13th I had my 3rd Fashion Design class with Helen. She wanted us to bring in a passport photo of ourselves for her to remember us by which is something I found a little bit bazaar. She wanted to keep our photo with the drawing we had done of ourselves in the first week. 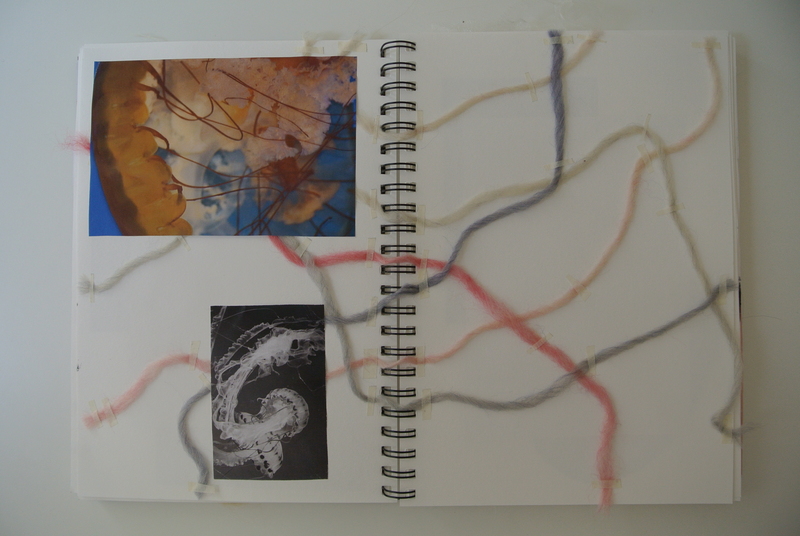 This week I progressed a lot with my work, finalising my 12 images and moving on with my sketch book. 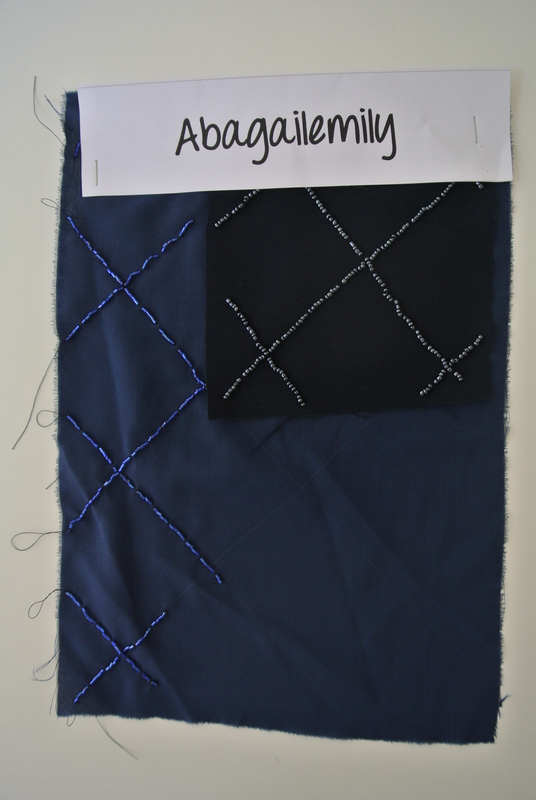 On Thursday I’d managed to finish off the basic pattern for my men’s waistcoat, so I started to cut my fabric. I bought a wool for the outer and a silk for the lining and back. We didn’t toile the waistcoats as the pattern was pretty simple it didn’t really need it. The pattern itself to make was really fun. Our Tutor Miao has a really good way of explaining things and makes things that if taught any other way you’d think were the most confusing thing ever! I also started to stitch together the main part of my waistcoat, and because of the pattern the pieces fitted together so easily. I already felt as if I was a million times better than my first week when I made my t-shirts. 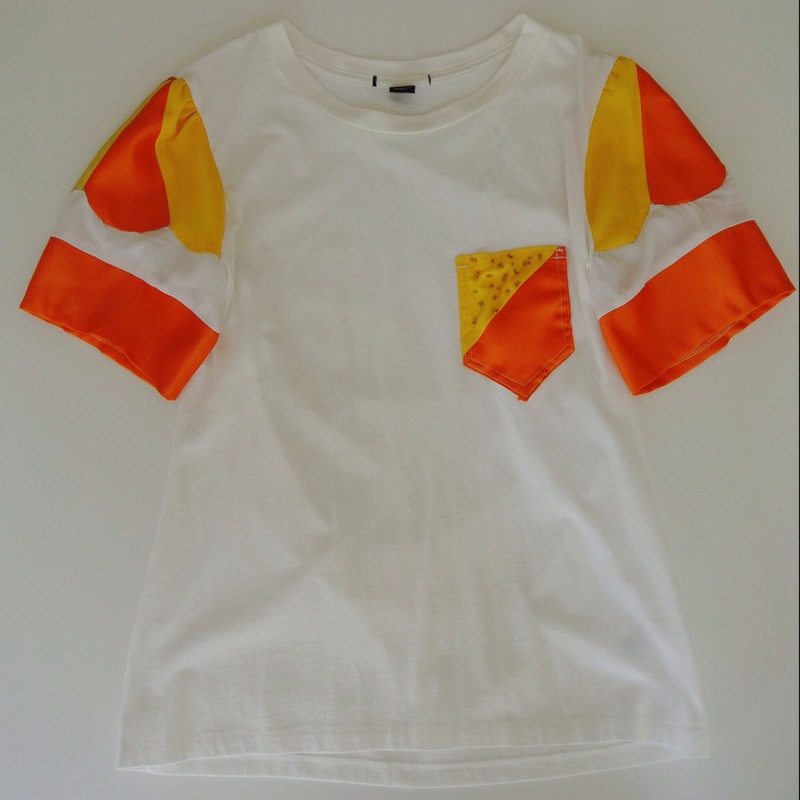 The pattern was so precise which made sewing easy, and if anything went wrong Miao was always there to help! On the 18th November I got the opportunity to see Tom Odell live. It was really nice to take a break from the work I’d been doing the previous week and also really exciting to go and do something different in Milan. The night itself was really fun, and Tom Odell was amazing, I’d definitely see him again! The next week was really busy, I had a lot to do in each of my subjects, so really my week was just about keeping everything up to date. I wanted to make sure the one subject I didn’t fall behind on was Fashion Design, as I felt that it would be hardest to catch back up on as there was such a high work load! 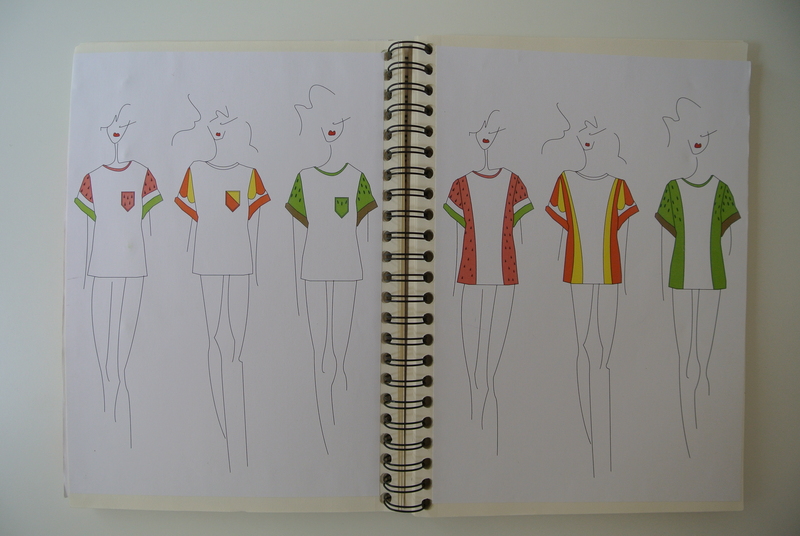 By this week I had just started to fill a little sketchbook with my first designs for the capsule collection. I bought a separate sketch book to start these designs with, so they could be sketchy and also edited and changed when I wanted, without them affecting the appearance of my research sketchbook. 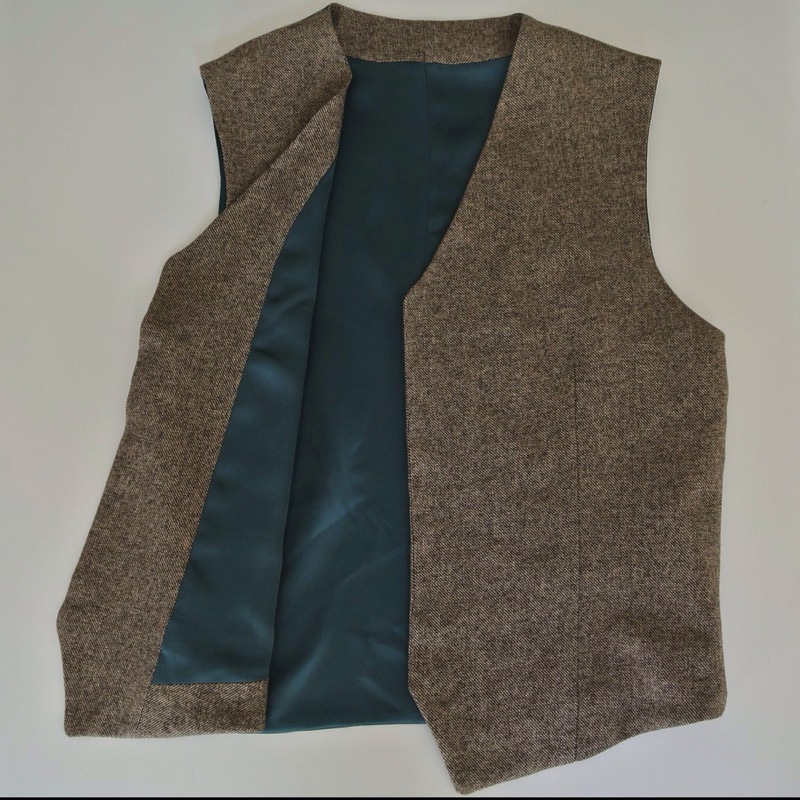 This week I also managed to finish my men’s waistcoat. I’m so pleased with how it turned out. I’m so happy with the quality I managed to achieve, especially after the quality of my t-shirts from October. I’ve seen a massive improvement in my skills in just once month. The last week of November came around so quickly! I couldn’t believe it was the end of the 2nd month I’d been in Milan. 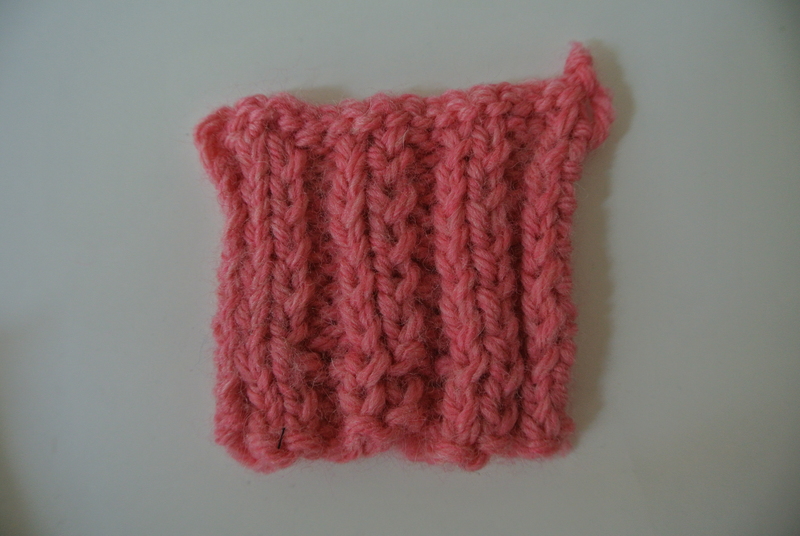 On Tuesday 26th I had a knitting assessment, and I actually did ok in it! I moved so far from the first week of my classes when I didn’t have a clue! I never thought I’d be able to knit, and to be quite honest, I’ve never really had an interest in it either, but now I’ve done it, I can see what I can use it for! The weekend of 29th Joe came out to visit me again, this time the weather wasn’t so nice, as it started to get cold and rainy! We managed to go to the Warhol exhibition that was on an Piazza Reale. I’m still not sure if I enjoyed it or not. It wasn’t really what I was expecting it to be. We had the audio guides which was really interesting, especially to find out that Warhol used to urinate on some of his paintings! I was also shocked to find out about a woman who one day walked into his studio and asked to ‘shoot’ his paintings. Warhol agreed thinking she meant take photo’s but she actually pulled out a gun and SHOT them! The most famous one was the Marilyn painting that she shot through the forehead. The first week of December went really quickly! (Much like the rest of my weeks) On the 3rd I had to do a presentation within a group using QR codes for marketing. 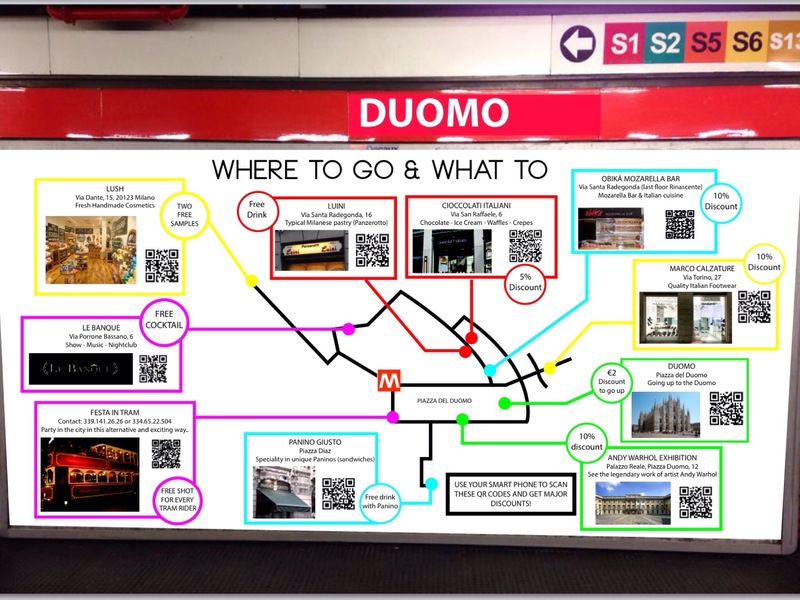 We basically had to create a poster to go on a wall that was interactive with QR codes. The idea was to supply a service to students. Our initial ideas for the wall were: last minute Christmas gifts, where you’d scan the code and the gift would be sent to the recipient. Club entrances, where you’d scan the code of the club you wanted to go to, you’d get a discount and would be able to pay online for the club entrance. Emergency Stationary wall, where you could scan the item you needed on the wall and it would be sent to you that evening. Pharmacy/ Convenience store wall, where you’d scan the item you needed and it would be sent to you within a certain amount of hours. An Ikea wall, Ikea is quite far out of the city centre, so we thought it’d be useful to have an Ikea wall with all the items you’d need such as bedding, lamps etc that you could order and get delivered to your door. Coupon wall, Where you could scan the code on the wall to get discounts from certain restaurants and shops. We decided to go with the last option of a coupon wall. We came up with this idea as we were all Erasmus students and there had been certain times in our stay that we hadn’t had a clue where to go to do certain things (for example lunch with my mum and sister!) We created a map using the metro stops where you could find each of the places. services in the area in which they are found. barcode and have great discounts for various services. The rest of the week was filled with my usual work, carrying on with my Fashion sketchbook and also starting to make a pattern for a Woman’s Blazer in Pattern Cutting. The woman’s blazer is actually a lot more complicated than the Men’s waistcoat! 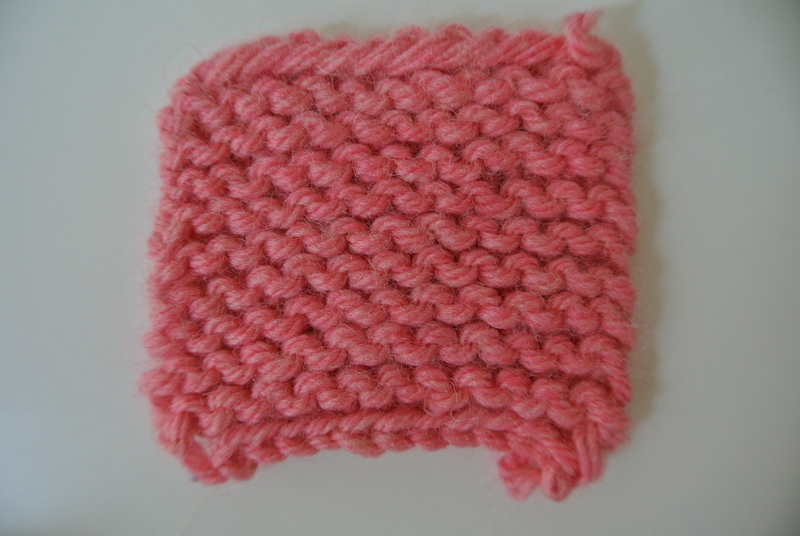 We used a basic block to start with that Miao supplied, and then had to adjust it to our own design. This week consisted of getting the basic jacket pattern sorted, and also the sleeve, which is really hard! The week starting the 9th was really all about preparing to go back to England. That’s pretty much all I could think about! I was so excited! I had to get together all of my work that I needed to take back with me so that I didn’t fall behind while I was back. 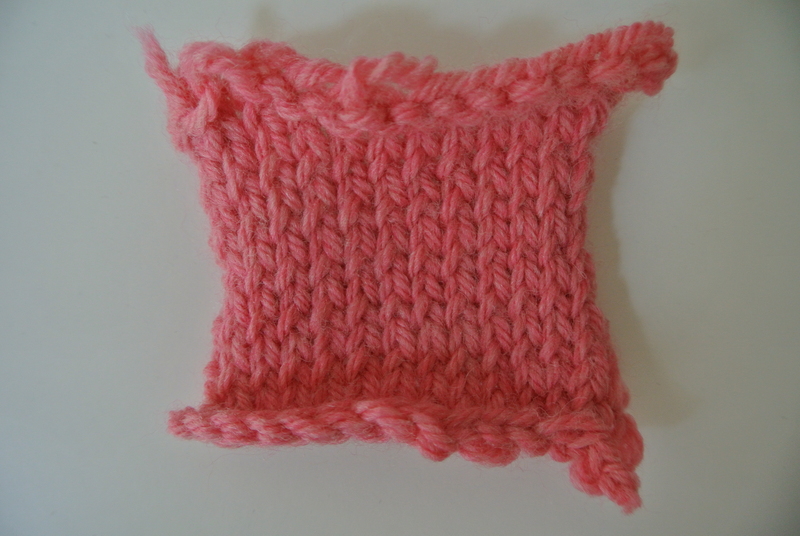 On Tuesday 10th we got set out knitting project for the exam. 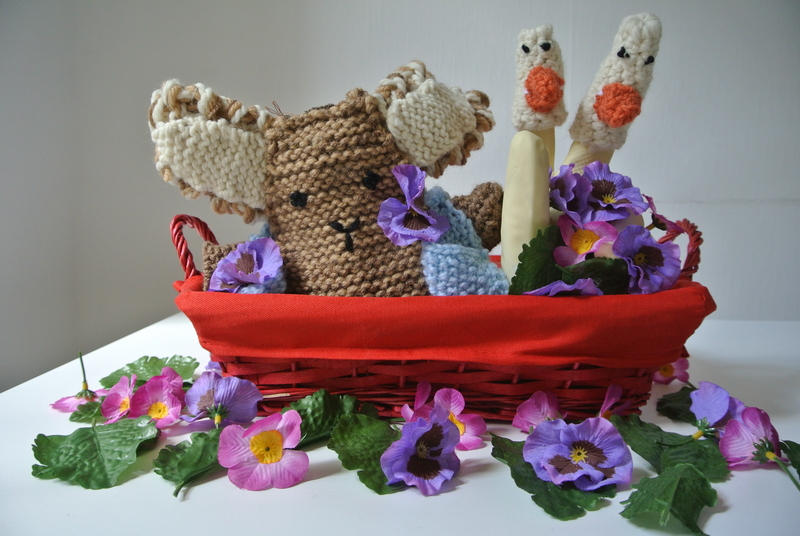 The project brief was to create a box in which we knit something that represents ourselves. My initial idea for this was to create a pair of hands as a sort of puppeteer and then the puppets could be all of the things in my life, like sketchbooks, paint brushes etc. 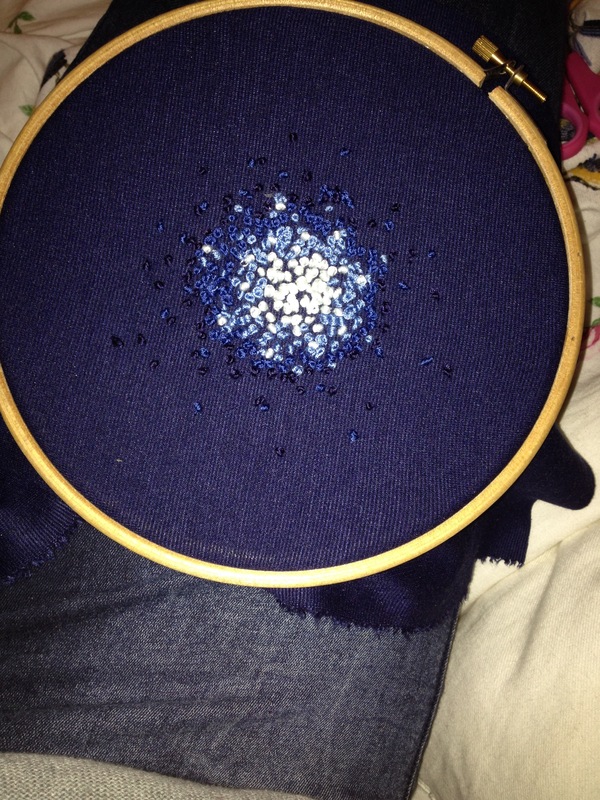 All of the images below show the stitches I now know how to do! Including cable, nut, jersey, seed, rib and tuck. 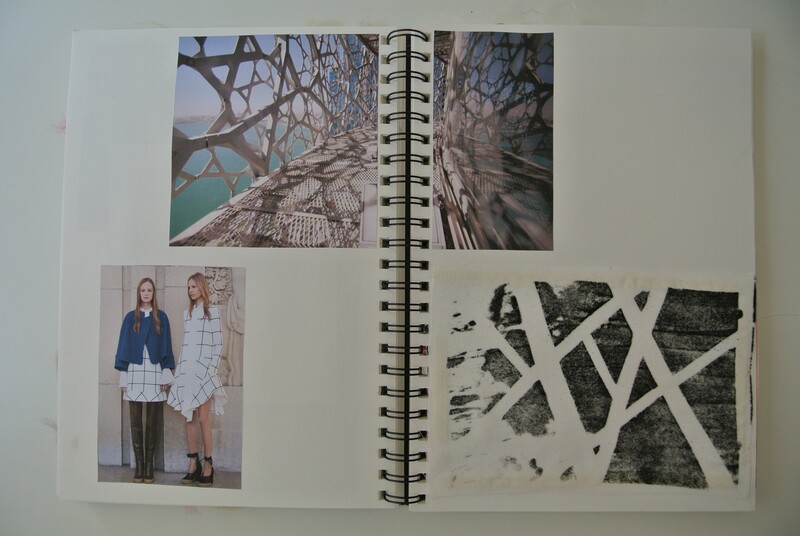 On Wednesday 11th we had a sketchbook review for fashion design with Helen. It went well but she said that I needed more work, which is something I struggled with because I was already putting so much of my spare time into the project! At one point I think I forgot I was actually in Milan and the project was all I could focus on! Basically, I needed to take my designs further and get fabric samples of what I’d like my garments to be out of. So that evening I decided to take a trip to Zara, which is a sort of district within Milan (not the clothes shop!!) In Zara there is a massive fabric shop, which was hard to find at first! I had a little look around to see which fabrics represented my collection best, I’d thought a little bit about texture but I had only really decided on my colours by this point! Getting the samples proved to be hard work. Nothing in Milan comes for free so obviously I was expecting to pay. The minimum amount of fabric you can buy in ‘Scamponi’ is 10cm, so basically you pay 10% of how ever much the cost per meter is. I picked out a few that I liked and tried my hardest to try and communicate with the people who worked there (this was the hardest part) they had an assistant who was just there for cutting samples, but she seemed very reluctant to try and help me even though I was trying my hardest to ask for what I wanted in Italian! By the end of the evening I walked away with about 10 fabric samples, so ended up paying about 15 euros for all of them. Having the samples in front of me when i continued designing that evening was so helpful! 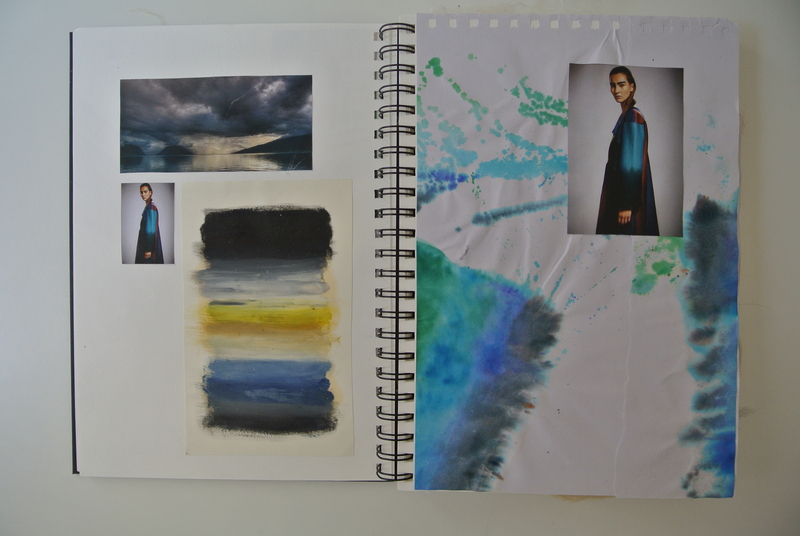 On Friday I had textiles, and I’d managed to get on with a lot of work in the previous months! This week we’d been doing felting, and learning how to put patterns into felt, which really hurt my hands because we spent the entire lesson with our hands in soapy water, and they were pretty delicate already from the cold weather! In the previous weeks I’d managed to try out devoré, flocking and lots of other fabric manipulation techniques. My favourite was devore, where you basically screen print a chemical onto a velvety fabric and the chemicals eat away the pile of the fabric in the pattern on the screen! It looks so amazing once its finished! On Saturday 14th I flew home for Christmas!! It was my second ever flight on my own, and I get pretty nervous about being in the right place at the right time when I’m at the airport. I’m not really an easy flyer! But once again there was nothing to worry about, but my flight was delayed for about an hour, and no one had said anything so I was adamant I was at the wrong boarding gate and I’d missed my flight. They never did say why the flight was delayed, or even apologise! Thank you Easyjet for making me so worried! The rest of December was spent simply enjoying myself and taking a well deserved break. I also worked a little bit at my office job that I do when I’m home for school holidays, just to earn a little bit of pocket money to fuel more adventures! Before Christmas I managed to go up to Birmingham as well to visit Joe. I also managed to arrange a day where a couple of friends from Coventry would be free, I managed to meet Paige and Jenny for an afternoon, which was so nice to catch up. We spoke about how all of our years out are going so far, I’m almost a little bit jealous of them both, especially Paige. Paige has been working at Claire’s Accessories Design office. She’s gained so much experience within the industry and has even had some of her products in store! Sadly (I’m not really that sad) I didn’t actually do a lot of work for NABA over the Christmas holidays, I fell a little bit behind with my design work, but I did do a little bit of knitting! But nothing worth mentioning! It was really nice to be home and see my family, friends and pets who I all missed so much while I was away. It was nice to be able to spend some quality time with the people I love! It also made me realise how much I actually missed England while I was away too. It seems silly, but even being in the street and understanding everyone’s conversations was really nice. It was also really nice to know what I was buying in the supermarket without having to try and guess what it was from the picture! It was nice to be able to eat English home cooked meals, I even banned myself from eating pizza and pasta while I was home! Before I could even say Merry Christmas, it was the New Year. I set myself some challenges to fulfill throughout the year and you can read that blog post here. I really wanted to make sure that I was going to be getting the most out of my time in Milan, because being home made me realise that I’d literally just spent my time so far doing work! The weather when I got back to Milan was actually a lot colder than England which I think surprises a lot of people! The rest of my week was spent settling back into life in Milan and catching up on the work I didn’t do over Christmas. For the first few days I was feeling pretty homesick, but after that it felt as if I’d never been away. On the 14th I was back into the swing of things and was starting my first full week back at NABA. By this point I was supposed to have a clear idea of what I was going to do for my knitting exam. I was still swaying towards doing a puppeteer themed project, but hadn’t really researched much into it, other than making a board on Pinterest. On Friday we were told in Textiles about what we’d have to do in our exam. We were told we were going to be making 15 of our own textiles, and present them in a professional way. 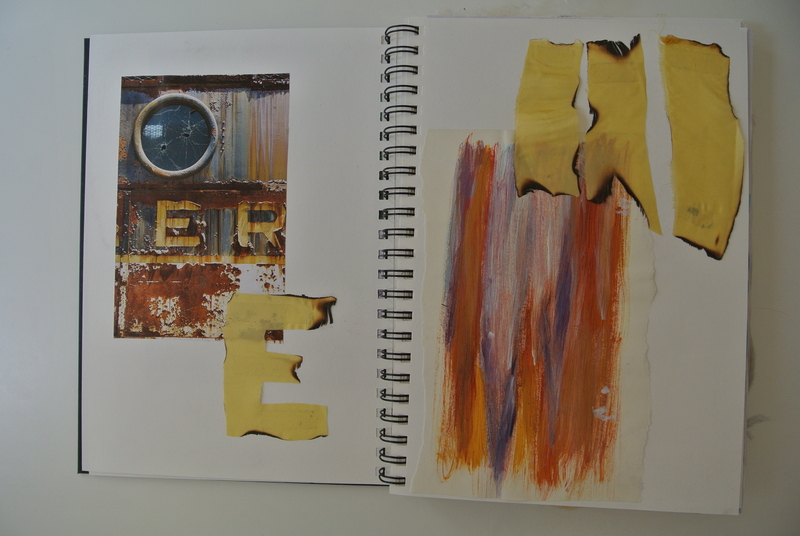 We also had to make a mood board and colour board for the textiles. It seemed logical to link the textiles project with the fashion design project so that it can work hand in hand. I spent the weekend getting my head around the fact that my exams were close, and getting as up to date as I could. 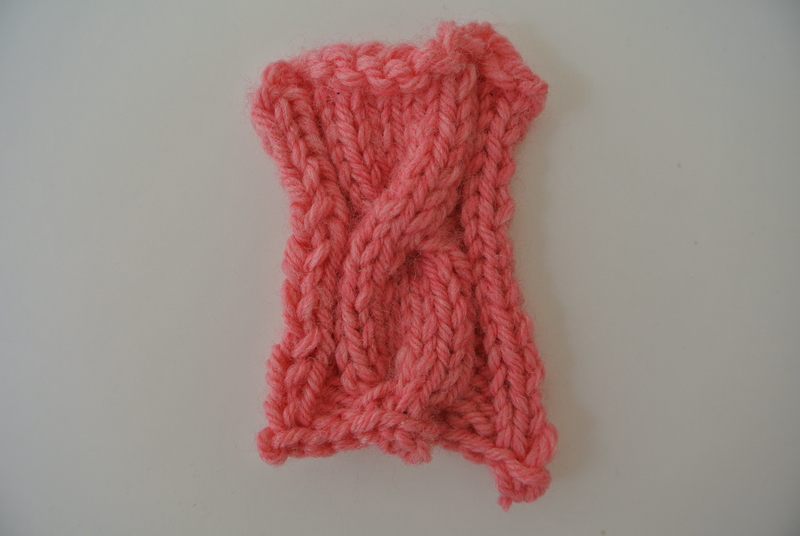 On Tuesday 21st I’d finally cracked my idea for knitting. I told my tutor that I was going to base my project on Beatrix Potter and the Tale of Peter Rabbit, as these were books that my mum would read me when I was young. I was going to create the characters in puppet form! My tutor, Denise loved the idea as she too knew the books. 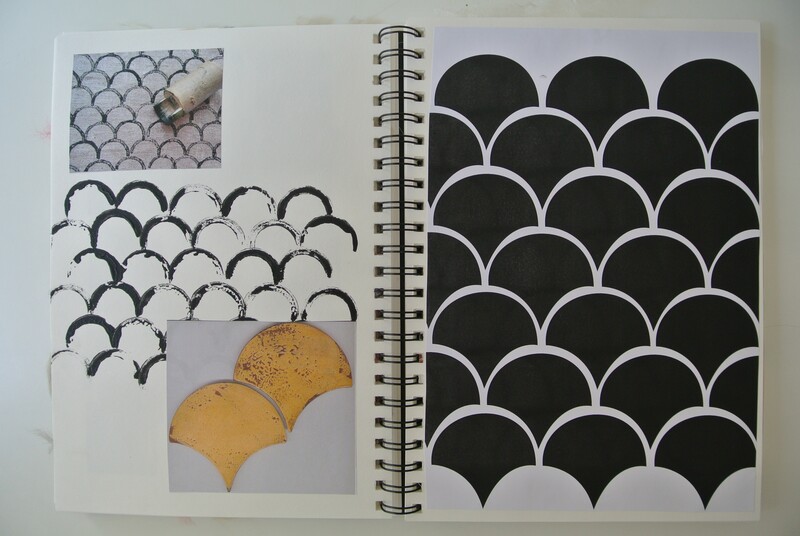 On Wednesday I had another sketchbook review with Helen. 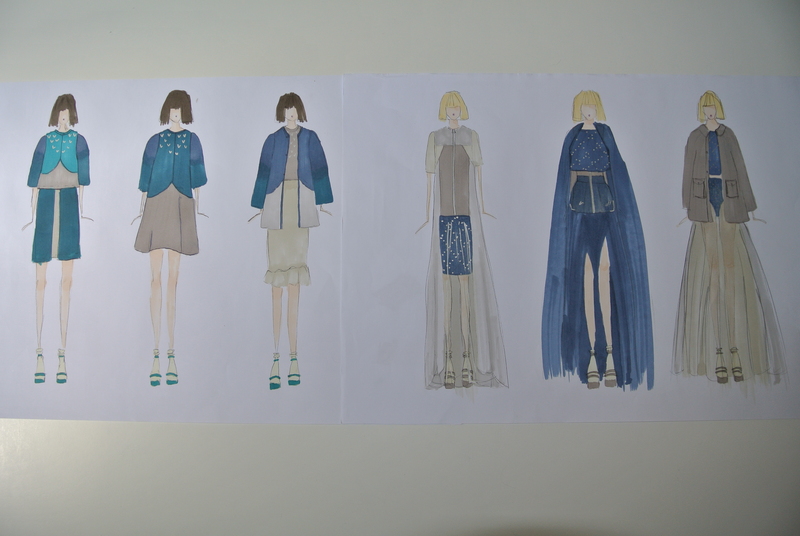 I showed her my designs for the two collections – but she didn’t really like them. She said that I needed to tone down my colours, and also that my designs were just too ambitious. In my collections I designed a lot with beading and scalloped edges etc, and she said it would be just too expensive to create. I went away and thought about what she had to say, and although I agree that it would be expensive to create, there are always ways around it! That week I spoke to Ann my tutor at CU about what she had said, and Ann suggested that maybe compromise, and use a print of beads in an interesting way instead, and that way I can show more skills too! 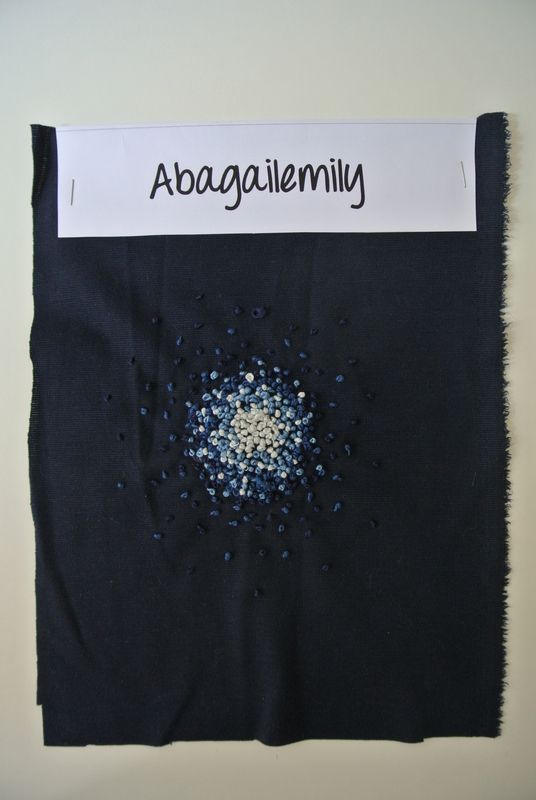 I also made up a few samples of the beading I’d use in my collections to show that it is possible!! I tried out a few samples trying to get prints of beads but I don’t think they turned out too well! I think that if I’d used my skills from 2nd year at CU and done it on illustrator it would have turned out much better!! I arrived back from Barcelona early on Monday the 27th and at first it was horrible to be back. I was really tired and I was going back into the busiest week that I was going to have at NABA, my last week of the 1st semester. This week was basically about making sure I had everything ready for the exam and I had all of the work possible done, or at least knew what I was going to have to do over the exam preparation weeks. 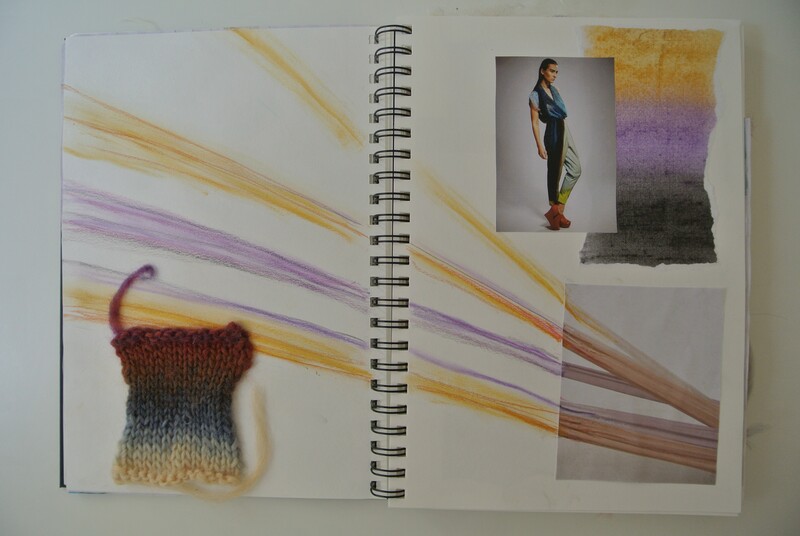 Because I was so late in getting my idea for knitting I had still only done a bit of sketchbook work for the exam, so this lesson was really about cracking on with the knitting itself. 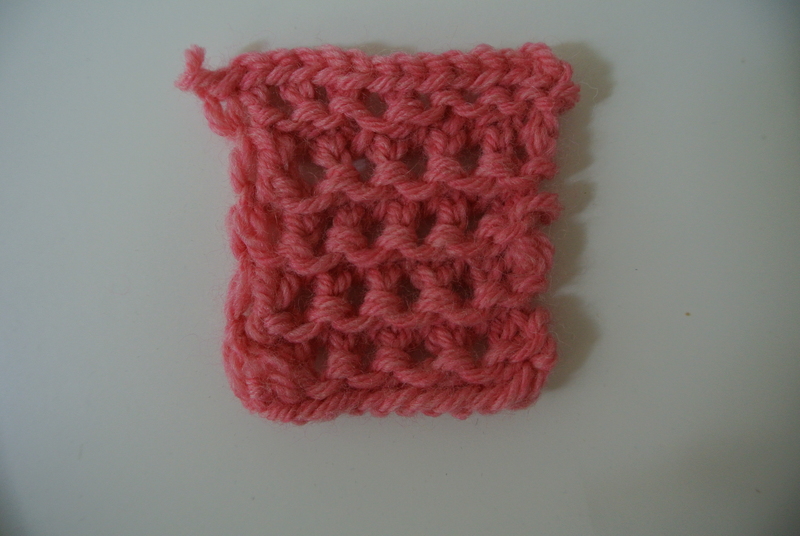 During the last few lesson after Christmas we were also taught to crochet, and we could use this in our exam. 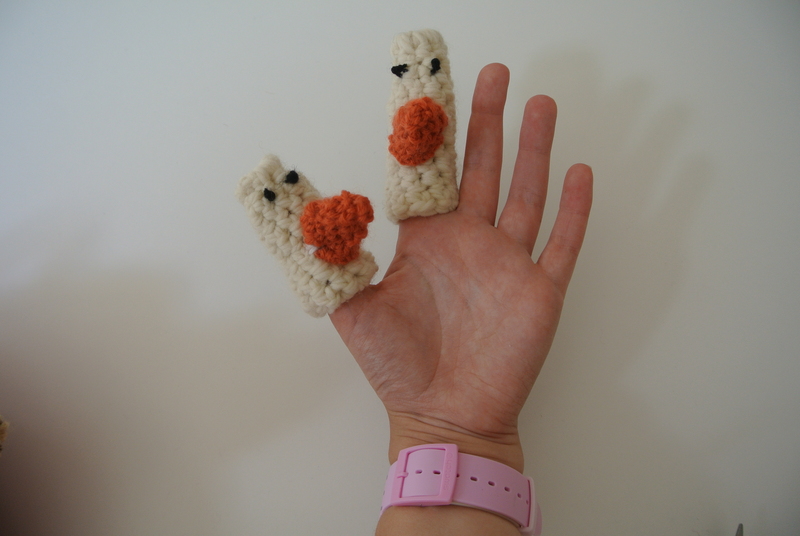 I wanted to crochet some finger puppets to look like Jamima Puddle Duck, so my lesson was pretty much crocheting tubes. The rest of the lessons in the week were just getting on with things, the tutors telling you what else you can do to improve your work and letting you know what the exam will entail. The word ‘Exam’ to me was pretty scary, because I’d not actually done and ‘Exam’ since i was 18 at sixth form. I asked Helen, our Fashion Design tutor and basically there was no more to an exam other than looking over your work, so it was basically just a review of everything that you’ve done and then you get your mark depending on the work that we complete. The first two weeks of February were simply exam preparation. The first two days, Monday 3rd and Tuesday 4th I went into the textiles lab to get on with some of my textiles fabric samples. By this point I already had about 5, which I was pretty chuffed with because I’d only had two lessons to get them done in. 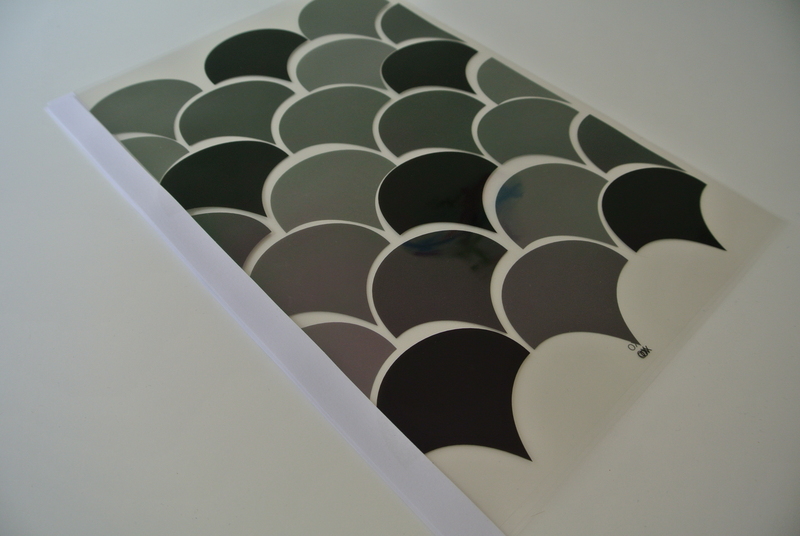 I wanted to screen print some scales for a few of my samples so I’d created the acetate screens ready to turn into silk screens. I’m still not too sure how it works, but I know that you have to put a green substance on the silk screen, and then burn the empty spaces (where they don’t have black ink on) onto the screen using a bright light. 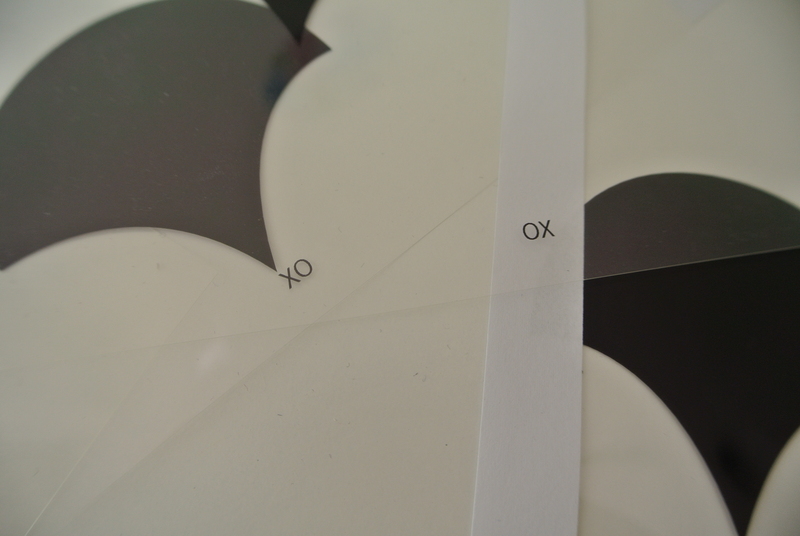 The printing that I wanted to do had 4 parts to it which would layer on top of each other, I had to mark the alignment point with an XO at the bottom – but unfortunately this didn’t actually work once I’d printed them. When I got to textiles Harri, my tutor told me that I could no longer do my design because there weren’t enough screens to go around. 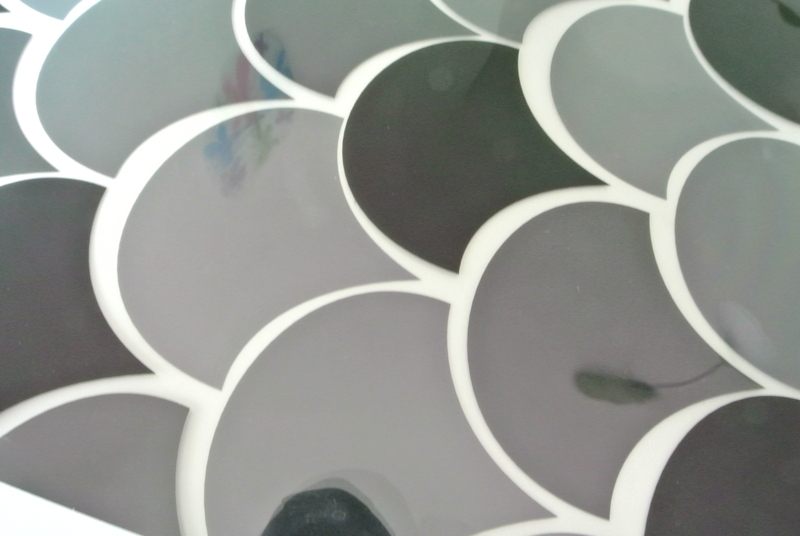 I was pretty disappointed to be honest because I’d spent a lot of money printing onto the acetate to get it perfect! She said that I could still do it with one screen and try and move it around to create the pattern that I wanted. 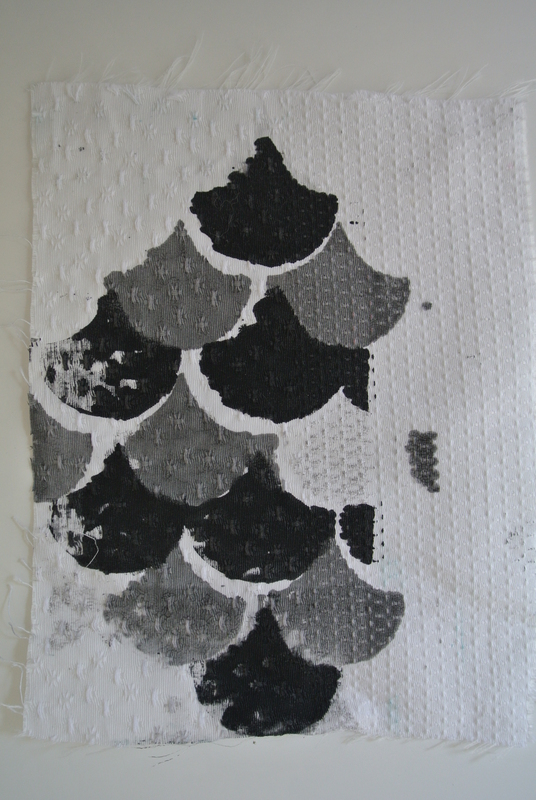 I gave it ago, but because this was my first time ever screen printing it didn’t really turn out very well! I have a sample image below. I decided it was time to give up on the idea and I was going to have to think of something else. The rest of my week was a blur of stress, I wasn’t keeping my diary because I was just too busy with all of the exam preparation. 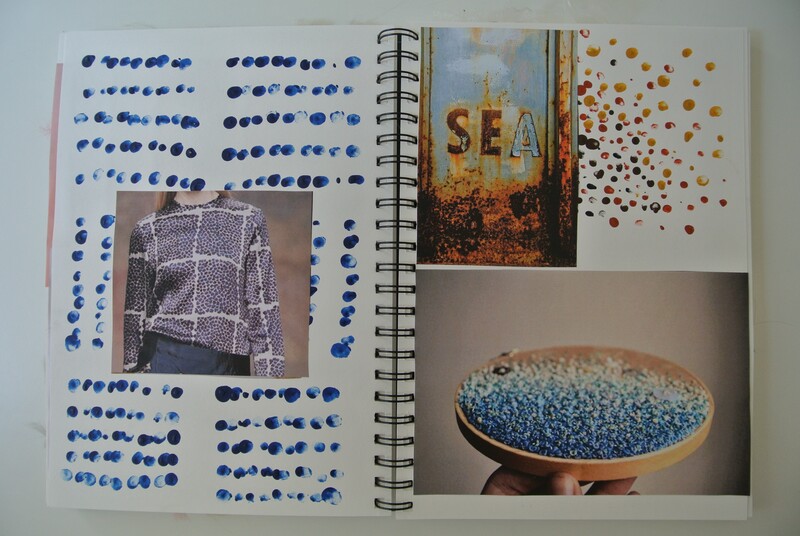 It was Saturday 8th February that I decided I was no longer happy with my sketchbook for Fashion Design and that I was starting again. Looking back on it, it was the most ridiculous thing ever, but I went to the stationary shop around the corner and bought myself a brand new sketchbook to fill 11 days before the exam. I got on with it surprisingly quickly and within a few pages I was so much happier with the work I was producing. I still kept the majority of my work and images but I just wanted to lay it out differently for it to look cleaner and less confusing. 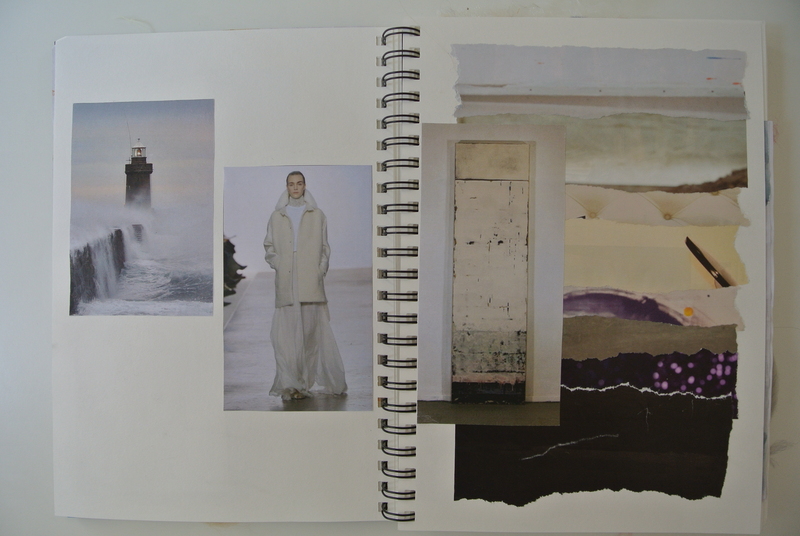 The majority of the images I’d collected were to do with the coast and boats and the idea of a shipwreck, so the fashion images that I also put in to my sketchbook had a similar feel. 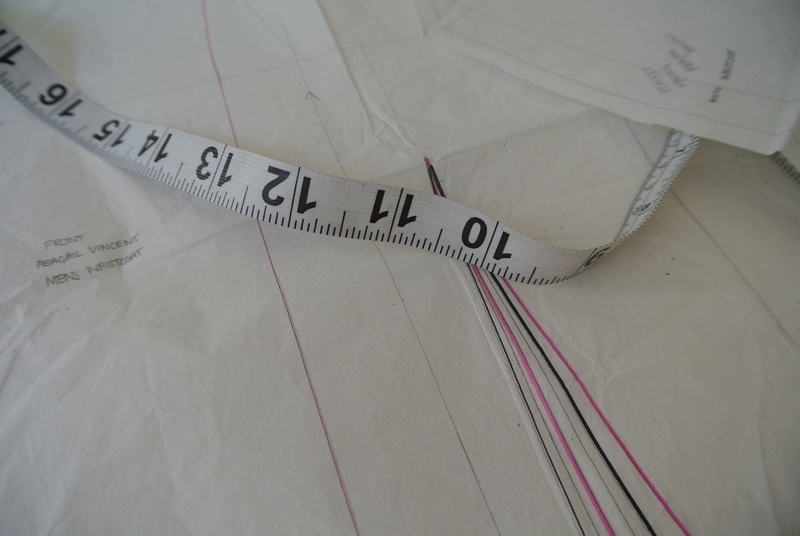 The biggest workload came from Fashion Design. 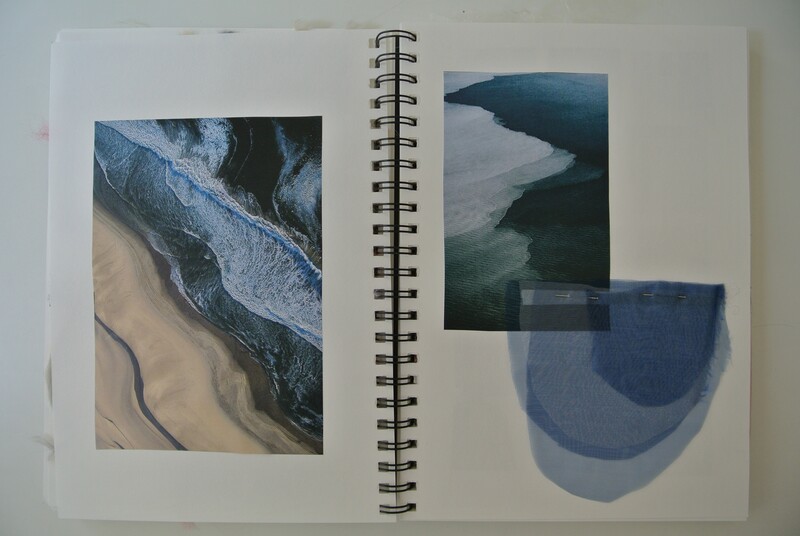 On Wednesday 12th I had to start getting my designs into a book to print. I made this on Indesign. It had to be a finalized product of everything we’d done. It had to have our 12 starting images, fabric samples, more images to support our designs, all of the technical flats and then finished illustrations. It was a big challenge getting this put together in the short amount of time I had left! On Thursday 13th my dad and younger sister came out to visit me. Although it was a really busy time for me it was so nice to see familiar faces again! I found it really hard to switch off from all of the work I had to do, so in the evenings and mornings of that weekend i stayed up to try and complete whatever I could get done! The weekend itself was horrible (not because they were there) but it would not stop raining! I had to try and think of things that we could do in the horrible weather, as usually if it was raining I’d probably just stay at home or wander around the shops trying to dodge the rain. I managed to think of some things and you can read what we did on my blog post about Milan here. On the 14th Joe came out too so I had the weekend with all three of them, which proved a really good pick me up from all of the stress I was under! On the 17th it was back to reality and exam week started. My first exam was in Marketing, and we didn’t actually find out what the exam was going to be about until very shortly before. Basically we had to pick a product that we thought didn’t get the attention it deserved. I made a power point presentation about the product that I chose, which was the ‘TangleTeezer’. I thought a long time about what product I was going to pick, and in the end I decided it didn’t really matter, as long as I can explain what I’d do to change the marketing strategy to boost their sales. I thought to myself ‘I could even do it on a hairbrush’ and that’s exactly what I did! I did a little bit of research into the market to see the different products that were out there, that were known but not extremely popular. 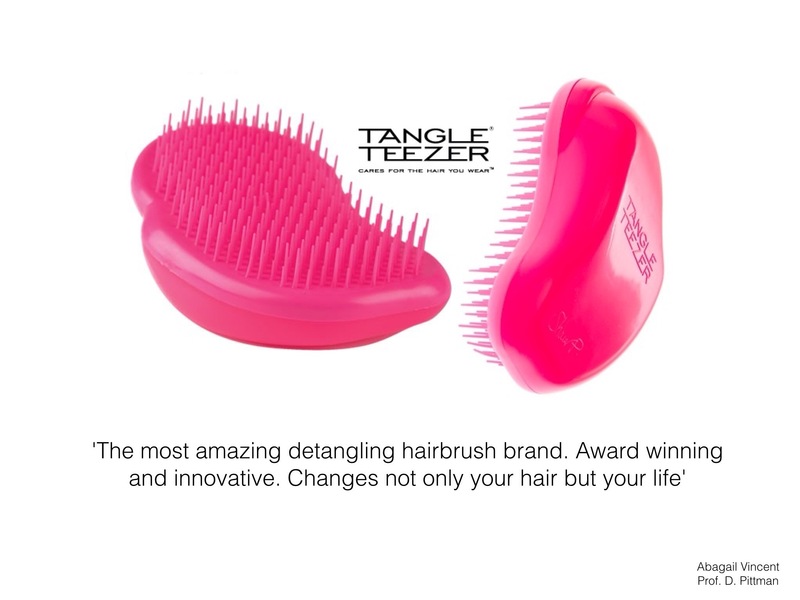 I had heard about the Tangle Teezer before, but didn’t actually own one. I asked a couple of my international friends, who had no idea what the product was, so it was obviously more popular in the UK than anywhere else. 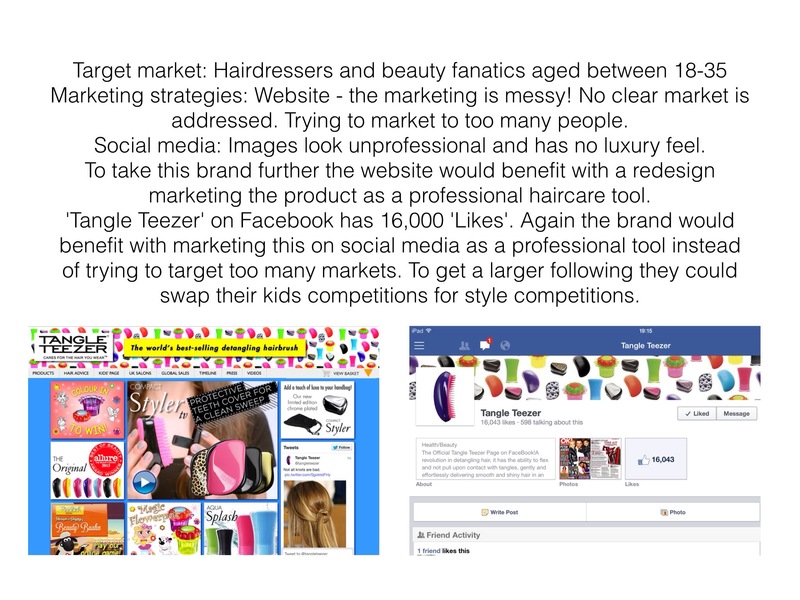 I took a look on the Tangle Teezer website and social media sites and it was clear that there was a LOT of room for improvement. I found that the website was very messy and on their social media sites they were trying to target literally everyone to buy this brush, when in reality they should have a set market to try and aim towards, and then sub-markets. This really backed my case in being able to say what I could do to improve their product position within the market. In my presentation I compared the brush with similar mid price range brushes and gave examples of how they were being marketed. If I were to market the Tangle Teezer I’d market it as a luxury de-tangling hairbrush with a clean cut and sleek website and social media sites, apposed to their messy and unorganised ‘in your face’ sites. The Tangle Teezer started off by selling in high end salons, so they should keep that reputation and try to make it a desirable product within the fashion and beauty market. I got a little bit too into the project and even emailed the PR agent Jacqui at Tangle Teezer to ask what their current marketing strategy is, and what the best sellers are. The reply simply backed up what I already thought, and they try to market to anyone who will take it, and the best sellers are the ones in the brightest colours possible. So I guess that that’s the explanation behind the bright website! I believe that if Tangle Teezer were to use social media in a more professional way, advertising their product as a celebrity and catwalk worthy product it could have a worldwide boom. I got so carried away with my project that I was even sending emails back and forth for a few days after my exam. The idea of designing my own way to market a professional product was really exciting. After the exam I was really pleased to receive 29/30 for my final grade. It was a great start to my exam week! 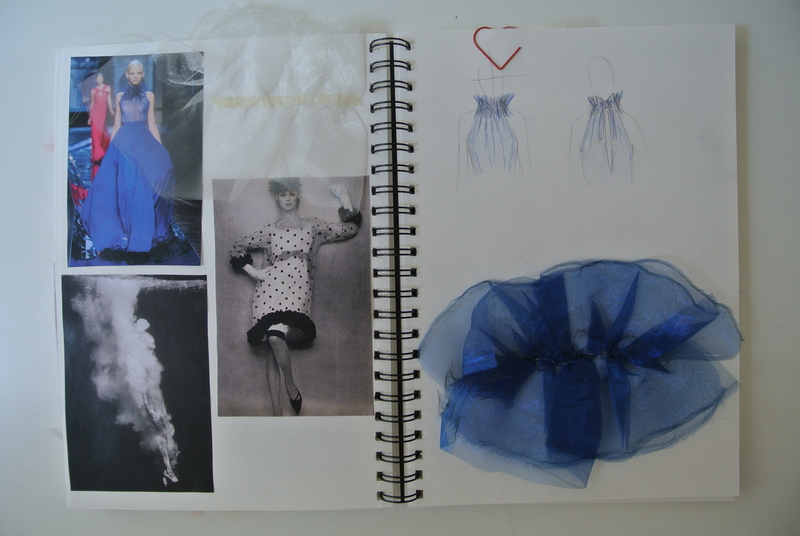 The next day, 19th February was my Fashion Design exam. I’d spoken to Ann about this at CU and explained how nervous I was about it, to which she simply replied that I basically need to take a step back and remember I’m in Milan to enjoy myself and get the most out of life! She reminded me that this was an additional year and that my grades received here don’t mean anything to my actual degree at CU. I was stressing out so much about this exam, and I really wasn’t happy with the final book I’d produced, I didn’t want to spend 40 euros on printing and binding something that I wasn’t happy with, so I took my sketchbook and designs to her and told her I wasn’t going to sit the exam and get a grade this time because I was unhappy with my work . I’m really dissapointed in myself for not taking the exam and getting a mark for the work that I’d spent what felt like a lifetime doing, but it was giving me sleepless nights and stressing me out so much that I deemed it not worthy of making me feel like that. I told Helen that I was going to continue to tweek my work until June and enter the exam then, instead. 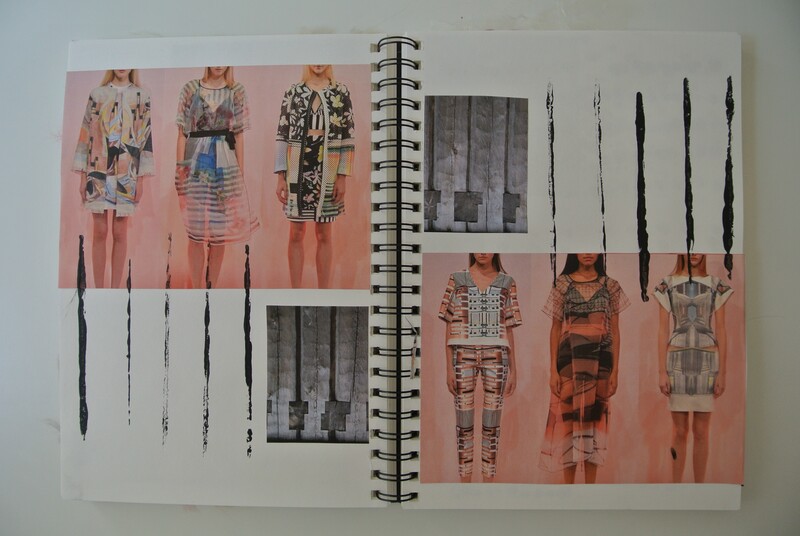 Although I had actually finished my work for Fashion Design I wasn’t happy with it and felt it needed adjusting slightly, especially my illustrations, to get it to a standard that I would want to show future employers. That same day was the Pattern Cutting exam. This was the one exam I really wasn’t worried about as I knew I had done everything I could. The Pattern Cutting exam was actually part of the Fashion Design exam so Miao marked my work with a grade of 27/30 which will go towards the Fashion Design mark that I will get in June. This is something that I really like about NABA, if you feel your work isn’t ready for the exam you can literally just take it along to the next exam and sit it then instead. 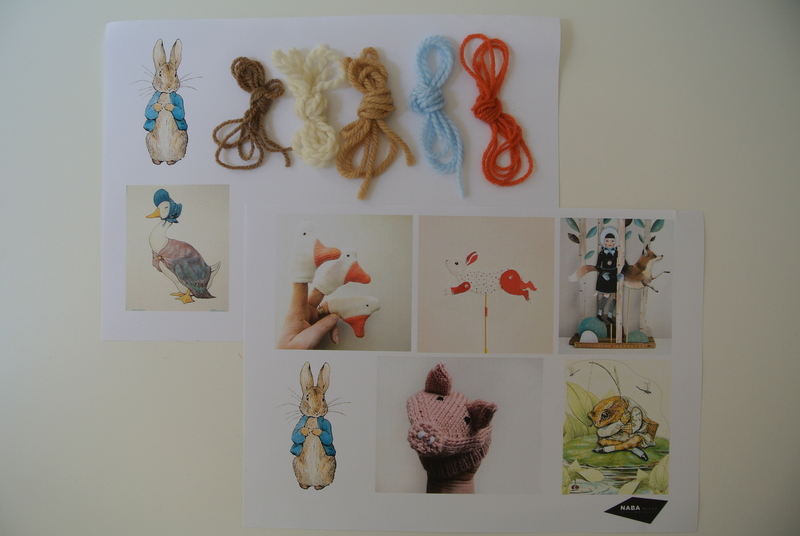 On Tuesday the 25th there was my Textiles and Knitting exams. I think that I had run myself down so much being stressed about the exams that I was forgetting what was important. I’d prioritised too much of my time to Fashion Design and not really spent a lot of time working on the presentation for these two exams. I handed my work in and both tutors decided they weren’t going to mark me on my work and wanted me to resubmit in June. They agreed that although the work I’d produced was to a really high standard they thought that I could do better and didn’t want to settle with giving me a mark in the low 20’s. 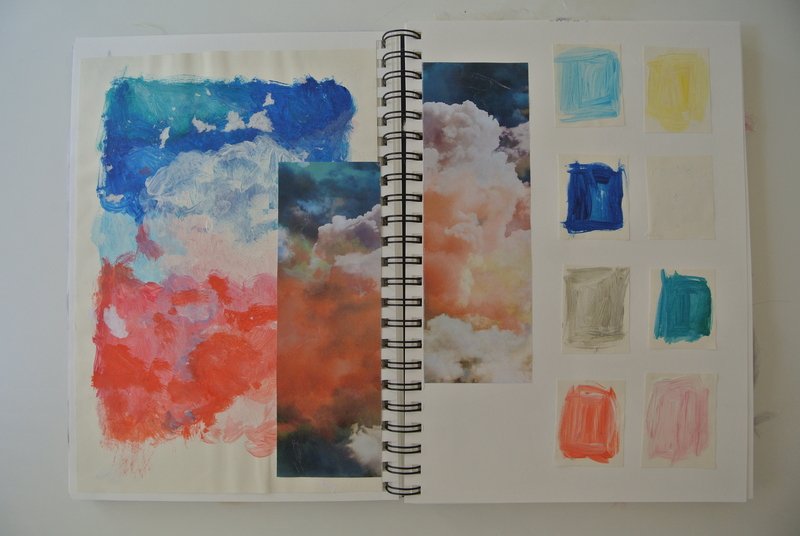 They wanted me to develop my sketchbook more to really give the work I’d produced the boost it needed. I was so relieved once the exams were over. I was dissappointed in myself for letting stress get the better of me but I’ve seen it as a learning curve to know that sometimes you really need to spread your time out evenly, and if you let stress overcome you, it will! As of the 26th February I had two weeks off to recuperate. I spent the first week just relaxing, wandering around a little but not really doing much, just trying to get back into the swing of normal living! March came along just as fast as any of my other months here! The first week of March was really fun. I had my friend Alice come and stay in Milan with me. Alice is also on the Erasmus scheme, but with Hull Univeristy, and she’s living in Perugia, Italy. Alice is one of my best friends from home in Dorset so it was so nice to see a familiar face and spend a little bit of time together! I showed her around Milan, and we had some really good weather! I took her for aperitivo in my favourite bar, Ginger and we walked along the canal popping in and out of the different bars until they closed. The next day we just relaxed a little and went out for lunch in the sun at a small café in Brera. As soon as Alice left, Joe arrived for another weekend in Milan. As the weather was still super nice we decided to visit Lake Como for the day. Before moving to Milan, I’d never even heard of Lake Como so I didn’t know what to expect. We got the train in at about 11am and spent the rest of the day wandering around and exploring what was there. You can read my blog post on it here. It was really nice to be around water again! I live right next to the coast in Dorset on a small island called Portland so I’ve grown up around the sea and definitely miss the water while I’m away at Uni. It’s not quite the same, but to see boats on the water was enough for me! Joe left again on the 9th and on the 10th it was back to uni again! The first class that I went to was a Performative Arts class. It was so bazaar, the entire class was taught in Italian, and my Italian skills are very, very poor. I had to ask my Spanish speaking friends to help me translate what the teacher was asking. Although tricky at times the class was really fun, and surprisingly relaxing. I think it was kind of like a drama class to boost our confidence around new people and to teach us to speak in fornt of people. My next new class was Illustration on the 11th. The tutor for this class was amazing. He was really calm and his work was so good. This lesson was basically and introduction into what we’d be doing in the course and also a little exercise so he could assess our skills. I didn’t really like this because I was around so many extremely talented artists, and my skills were pretty average! Never the less the tutor could see the best in everyone’s work and told you what he liked about your work, your strong points and what you could improve on. On the Thursday I was a little bit naughty and skipped the day of Uni to go and visit Alice again as she and her mum, Tracey, were in Bergamo, about 50 minutes away from Milan. The only class I missed on that day was History of Contemporary Arts from 9-11am, and I never will know what I missed! It was nice to get out of Milan again and visit somewhere new. I met Alice, Tracey and Rochelle (Alice’s friend from Hull also on Erasmus!) at the train station and we walked into the center of Bergamo to get lunch which was super nice because the weather was amazing and we could sit outside! 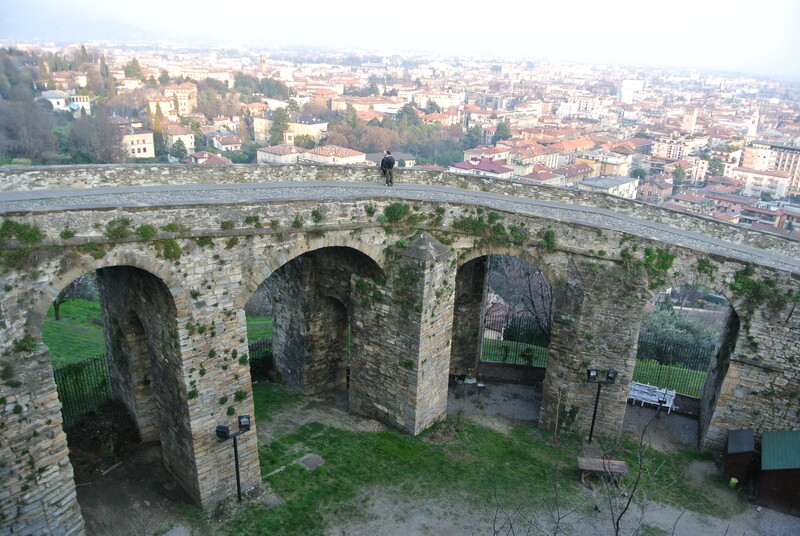 The day was really nice and we simply spent the rest of our day exploring Bergamo. You can read my blog post here. Tracey left to go to Lake Como, and Rochelle had to meet her friend so we met another friend of Alice’s, Agnes. We wandered up to the top of Bergamo to the ‘old town’ and found a little sweet shop and sat at a viewpoint just watching life pass by. That evening we went for aperitivo at a new bar in the ‘new town’ where we accidentally bought non alcoholic cocktails for the extortionate price of 10 Euros each! I was so grateful of Alice letting me visit her and Tracey in Bergamo as I got to meet all of her friends who were close by to me, who are now people I can keep in contact with and meet with in either Bergamo or Milan. That weekend they even invited me to go out with them in Milan, which was really nice and really fun! On Friday 14th I had my first photoraphy class, and it was quite literally love at first class! We were learning about the different ways in which to use your camera and how to use it in different lights, and our teacher even explained how you can take a brilliant photo on your iPhone, if you know how to work it properly! We spent the first half of the day in lecture about different cameras and how to use them, and then the afternoon was spent playing around with a Fujifilm Intstax camera, which are basically like Polaroid, which was so much fun! That weekend I spent exploring and simply enjoying Milan, going out with friends during the day and evenings. The next week was spent getting into the swing of the classes and deciding which classes I wanted to continue to study and which I wanted to drop. I really did enjoy all of my classes, but I made the decision to drop quite a few, just so that I wouldn’t get into the stressball that I was in February. I wanted to give myself a lighter workload so that I could really enjoy my time in Milan, and celebrate the life that I now lead! I wanted to make sure I had time to go out with my friends in the evenings instead of spending every single day locked up inside worrying about nothing apart from work! The lessons I decided to keep were Pattern cutting, simply because I love it. This is the lesson I enjoy the most, I’ve learnt the most from it and I feel it will really really help me in my 3rd year to make my final collection. I also chose to continue with Photography, because its something I’ve been going on about wanting to learn for such a long time! I thought it was about time I learnt how to use my camera properly, so that I can take provisional photos for photo shoots I may want to do in the future. Lastly I kept Accessories, this one is my least favourite out of my choices, but I thought it would be a new skill to add to the one’s I’ve already gained from this experience. The next week, starting 24th March, I got to experience my first week of my new timetable. On Monday I had my accessory class where we were given a designer to complete the project on. This project was group work so we all had to work as a team to get it done. The designer we were given to research was Céline. I’d never really thought of Céline’s work as something that really inspired me so I thought it a good opportunity to delve into the world of her design work. For the next class we had to produce a presentation on the designer to show the rest of the students. I found it pretty hard because the communication within my team didn’t seem so great, and the presentation was left very last minute, which isn’t something I like to do! Wednesday was my next class and that was Accessories again. We spent the whole lesson listening to people’s presentations, but didn’t actually have time to present ourselves. It was really interesting to listen to everyone’s presentations as I was learning things about designers that I didn’t already know. Thursday came around and I had my pattern cutting class. This was really exciting because we were starting to make the patterns for the garments we designed for Fashion Design in the previous semester. I was going to start off by making a jacket from one of my collections. In the lesson I pretty much finished the pattern, I just had to check the seams and also make sure that the sleeve was right. On the week starting 31st March I was pretty excited because I’d booked flights home for a month over Easter. I had had a really good weekend before so I hadn’t had time to pack so that was really my main focus along side my two accessories classes on Monday and Wednesday. On the 3rd of April I finally flew home for Easter! I was flying on my own again, but I’d kind of got used to it by now because I also flew to Barcelona on my own, so it was nothing new anymore! 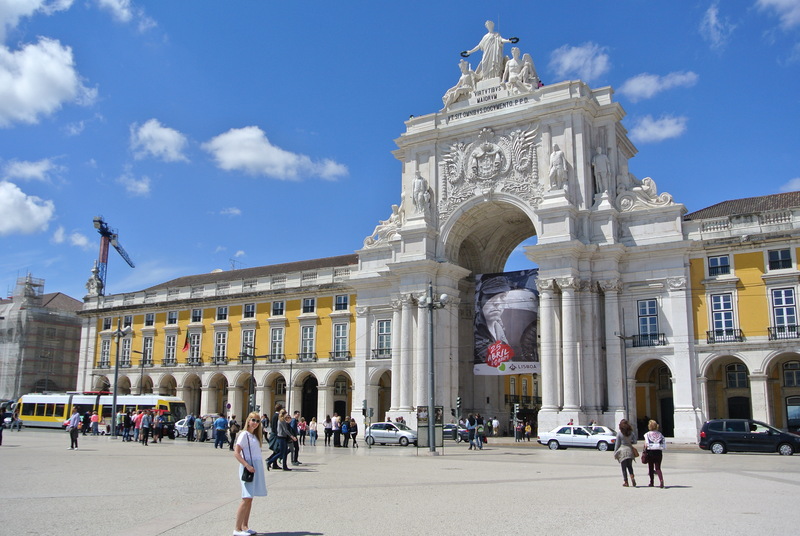 I spent my Easter break working again to earn a little bit of money, but I also got to go to Lisbon, as Joe had booked it for my Birthday. Lisbon was really nice, I’ve still not finished my blog post on it yet but I will be posting it in the next few days / week. We pretty much spent our time there exploring, but we also went to the beach a few days which was really nice as it was finally time to fully relax. Other things I managed to do during my break was finally visiting Brighton, you can read my blog post here. I’m so grateful for the amount of travelling I’ve managed to do this year, which probably wouldn’t happen if I hadn’t gone away. My little sisters prom is coming up so she also asked for my help to make her a floral crown for it, after the ones that I made last year. It was really good to be making and creating my own products again as I really enjoy doing it. This crown is definitely the best one I’ve made to date! It has 3 different sized flowers, added leaves and also added pearls! I’ll be doing a separate blog post on this too! I also went to GoApe on my actual Birthday, which is a tree top adventure obstacle course. It was really fun and I’d recommend it to absolutely anyone! We arrived back in Milan late in the afternoon so just took it steady as we’d spent our entire day since 7am travelling! We went to Ginger bar for aperitivo and then had an early night! Being with my mum was luxury, because I got to stay in the hotel with her! The 1st of May was an Italian bank holiday (for May Day, they do it properly here! ), so as promised I took my mum to Lake Como. The lakes were really really busy this time! It was such a contrast to how quiet they were when me and Joe went. There were massive queues for everything, so we just wandered, and managed to go on a boat ride in the afternoon. I didn’t enjoy the lake as much this time, because of the amount of people there, I don’t really like busy places, and it was exceptionally busy at the time! I also noticed that the center of Milan had pretty much tripled in numbers. Me and my Mum spent Friday shopping in the center, but there were SO many people! It was such a contrast since when I left it was a lot quieter! On the Saturday, we went to Venice. This was so exciting as I’d wanted to go for a while. Venice was amazing! The weather wasn’t brilliant but it was so different to anywhere I’ve ever been before! 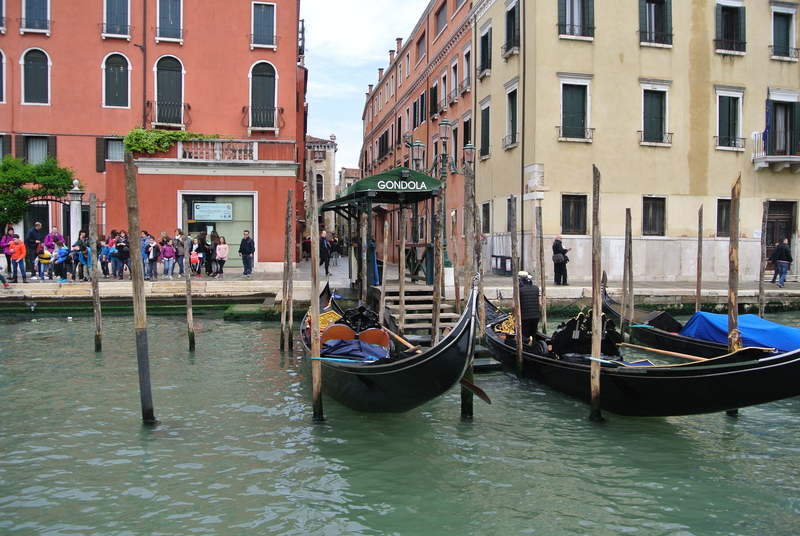 I’m still writing a blog post on Venice too, so I’ll post a couple of photos now but explain more in my future post! On the Saturday, my Mum flew home. It was really sad saying goodbye to her at the airport, as it suddenly dawned on me I was on my own again for a couple of months! That evening I arranged to meet up with a couple of friends to try and take my mind off of missing my Mum! !